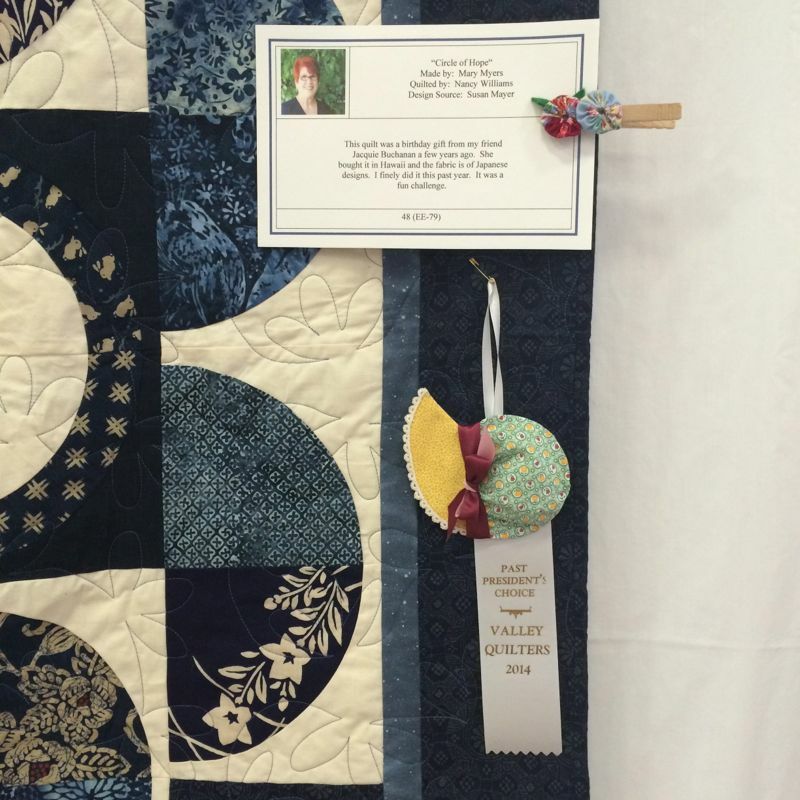 Posted on February 24, 2014 by Elizabeth E.
It was a beautiful day that the Valley Quilters held their quilt show, and I had a morning free, so I headed down to Hemet, about 40 minutes away from my house. 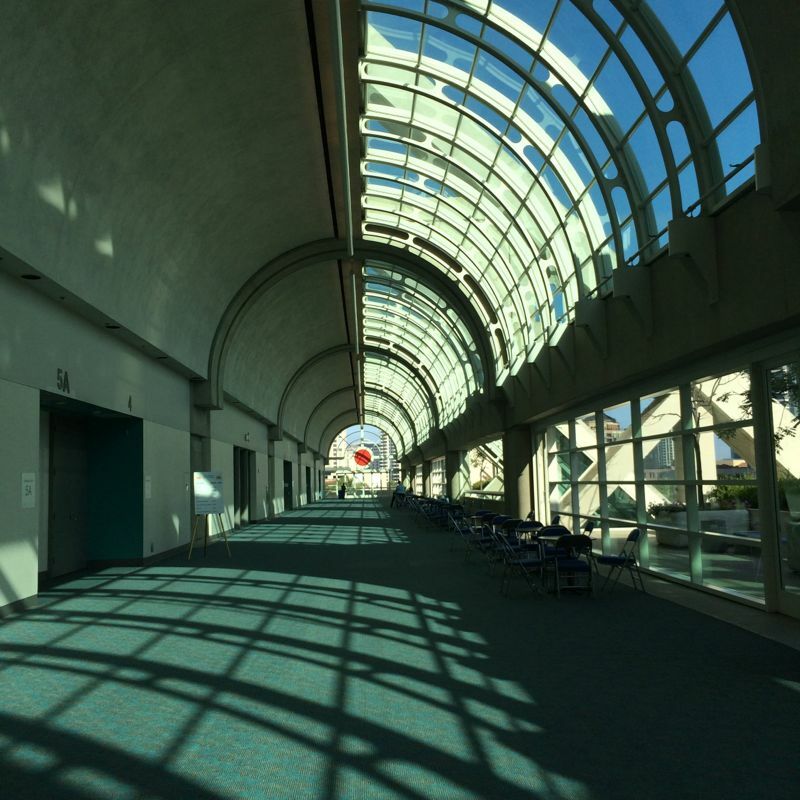 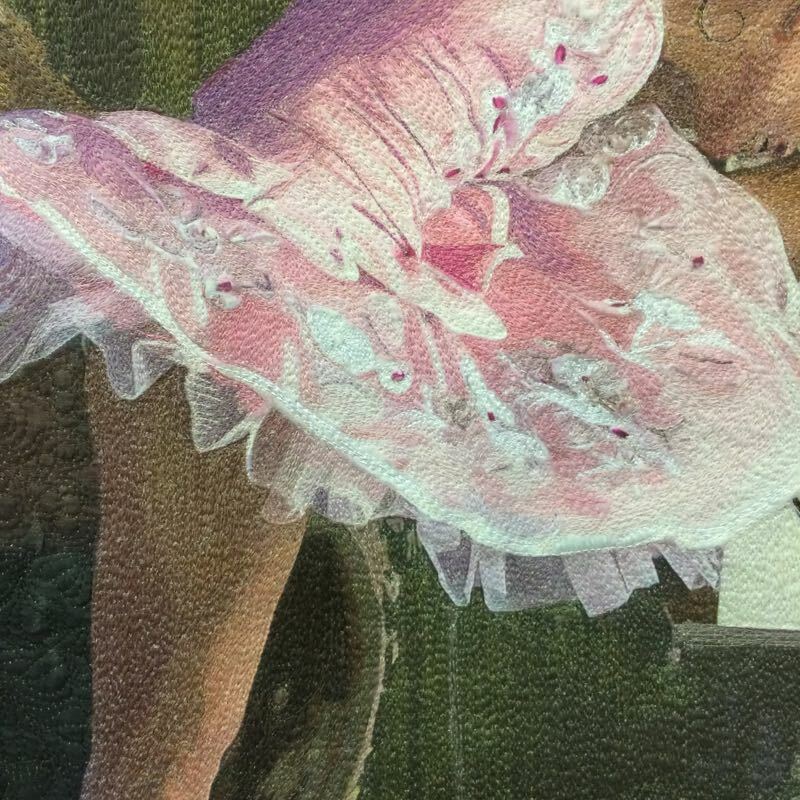 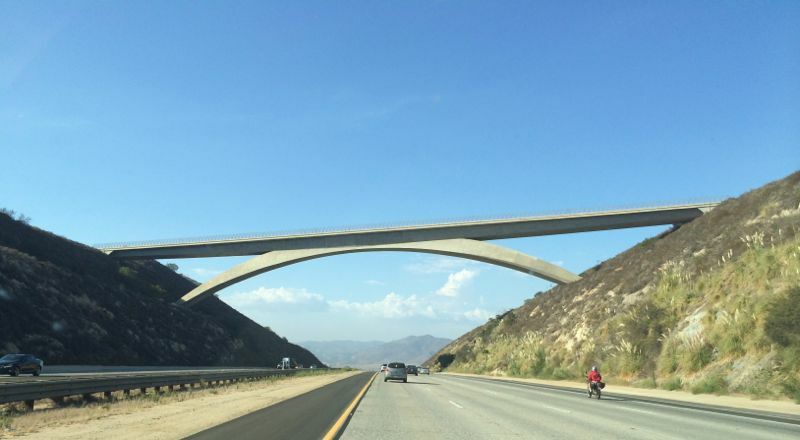 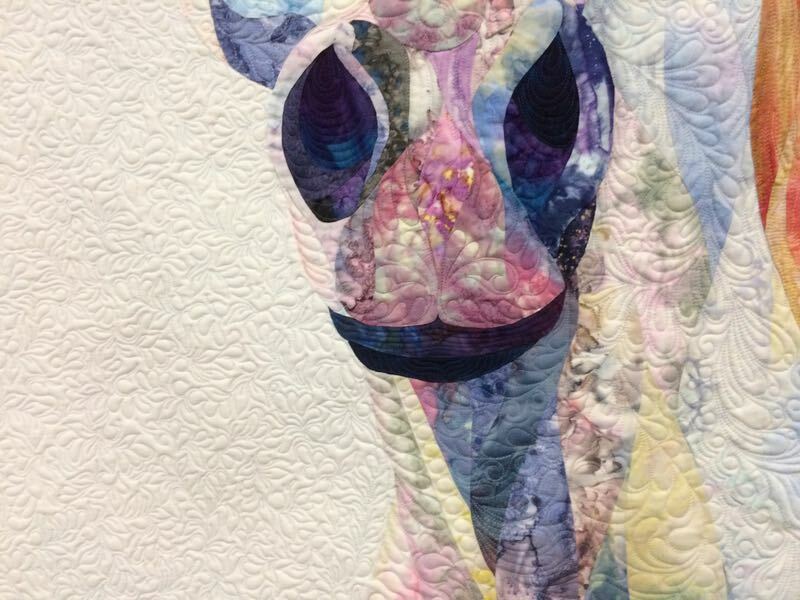 I like going to this small show–it’s kind of the antidote to all the craziness and glitz and flash and overwhelmingness that is Road to California. 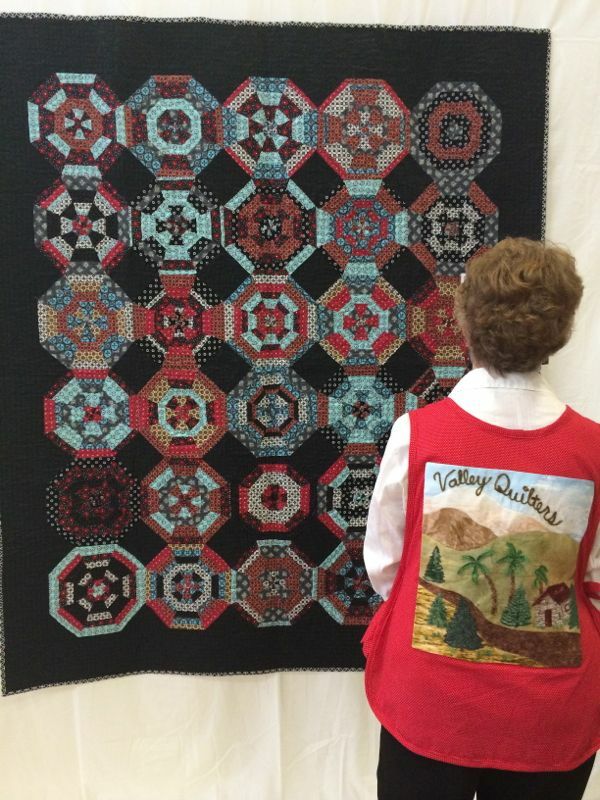 This is what greets you, as you enter the community center gymnasium: Glacier Star, by Shirley Mykris and quilted by Diane Best. 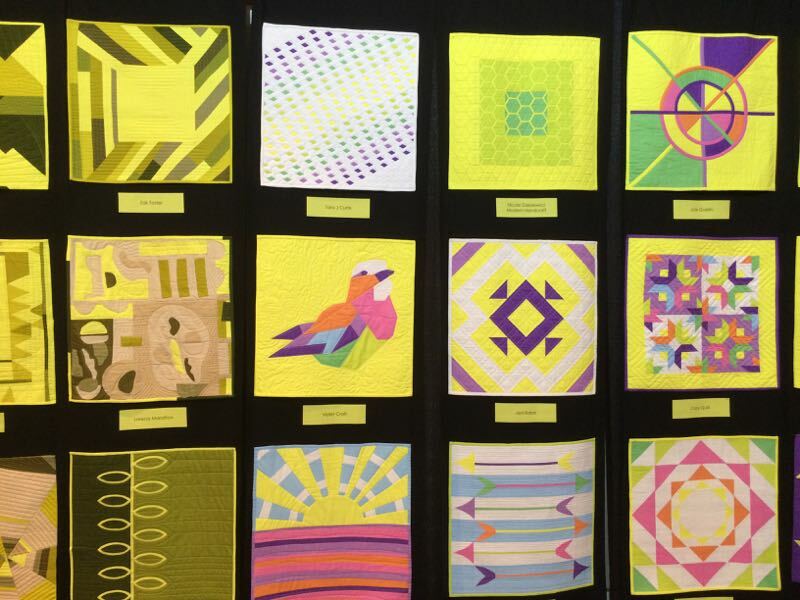 I meandered through their display, so these quilts are in no particular order. 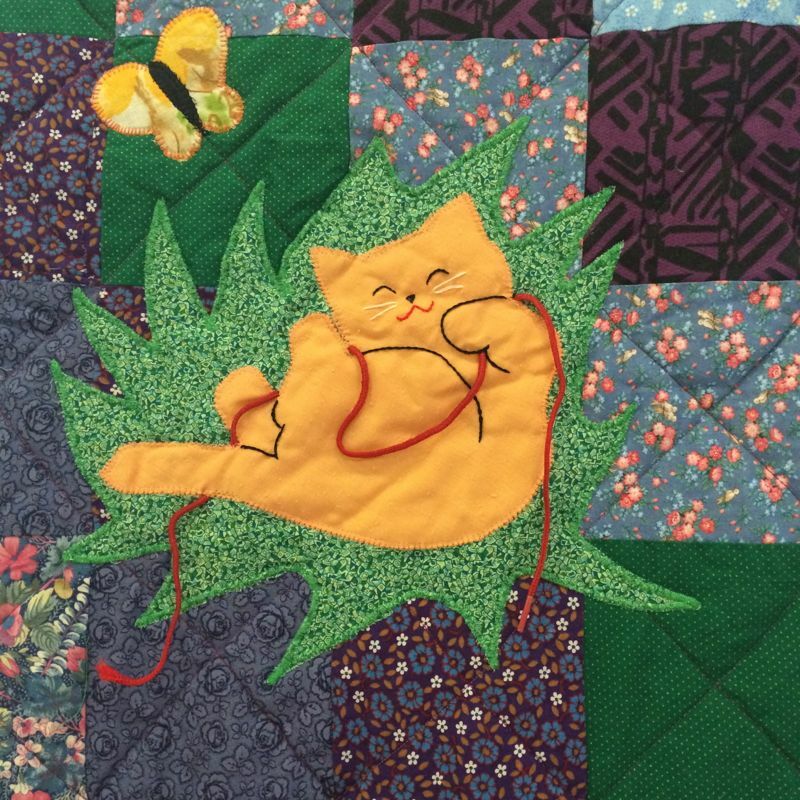 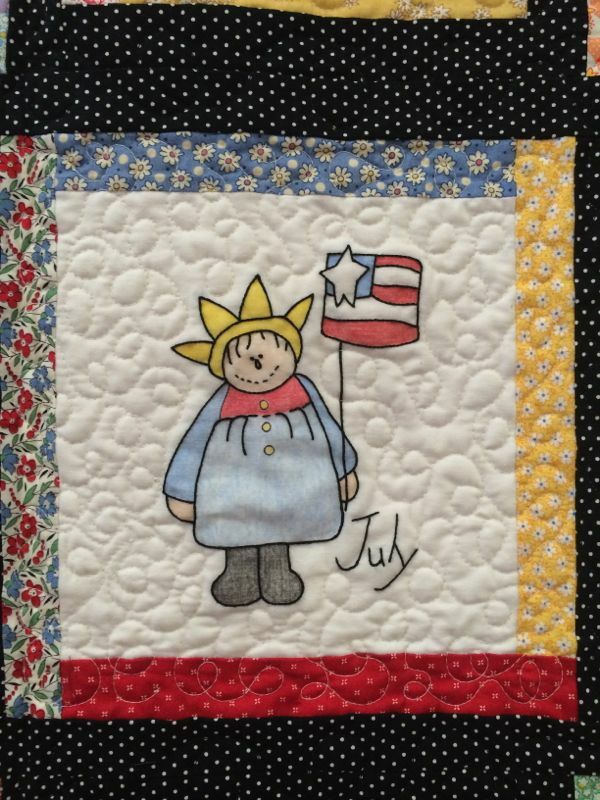 This Is Me, by Beckie Stabile and quilted by Marvel Dorf. 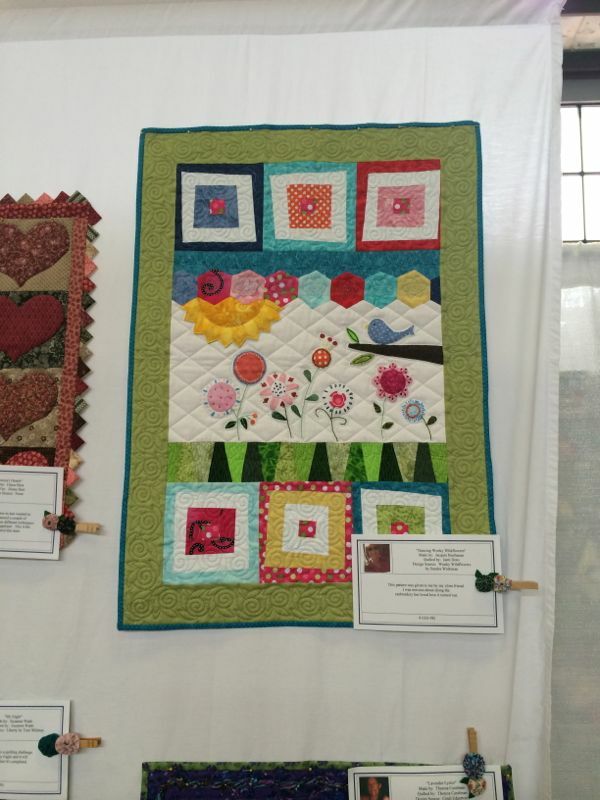 She said in her notes that these are her favorite quilting things. 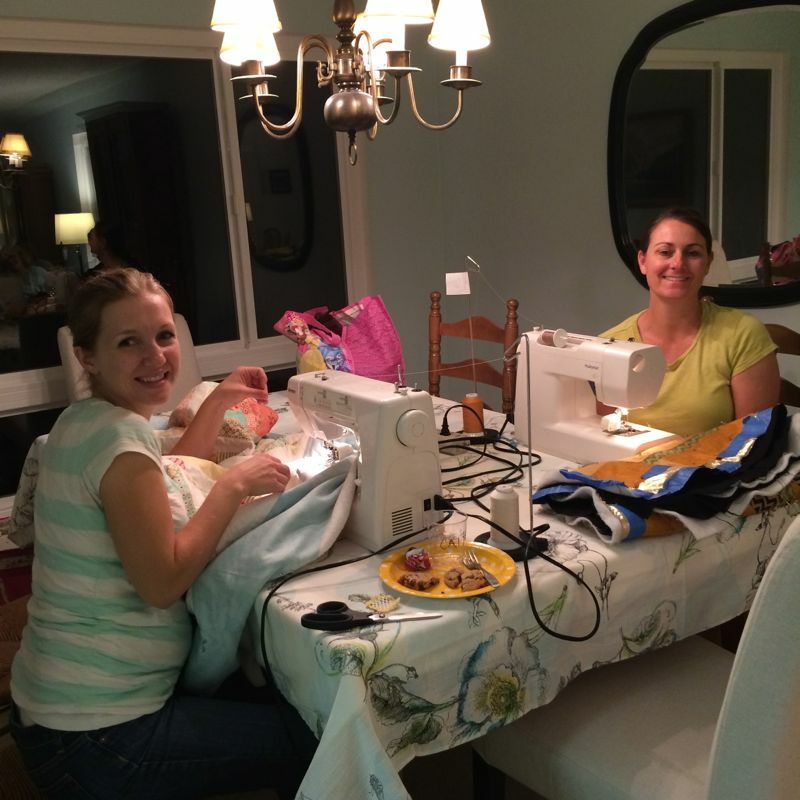 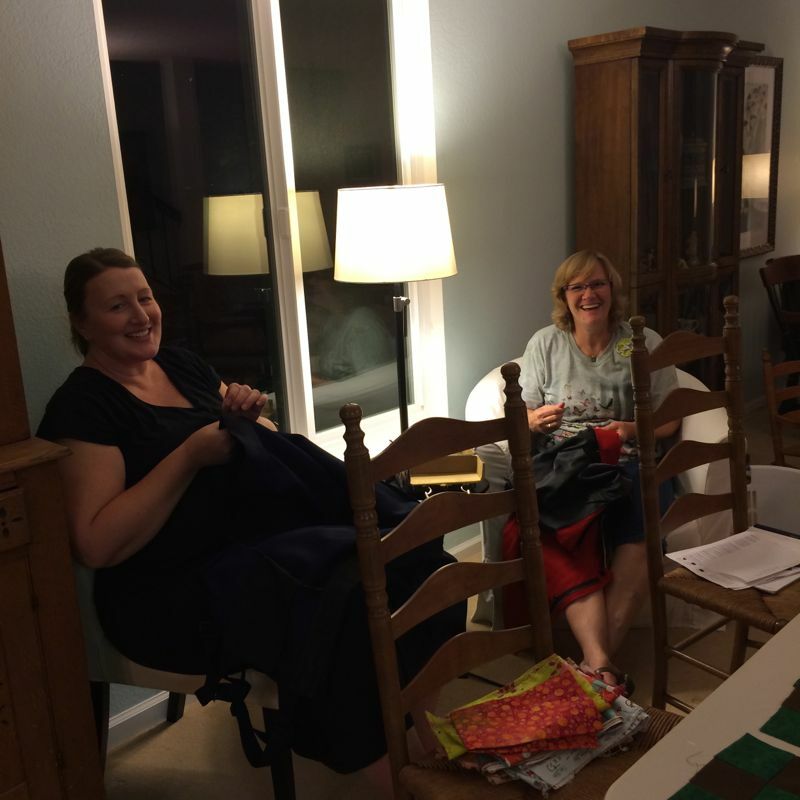 All the helpers were wearing decorative tabards. 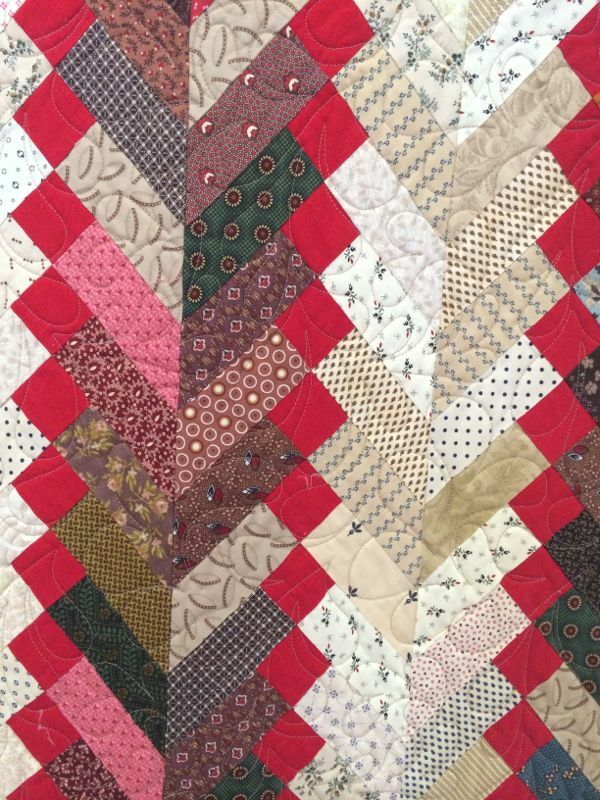 Here’s a detail of the quilt above. 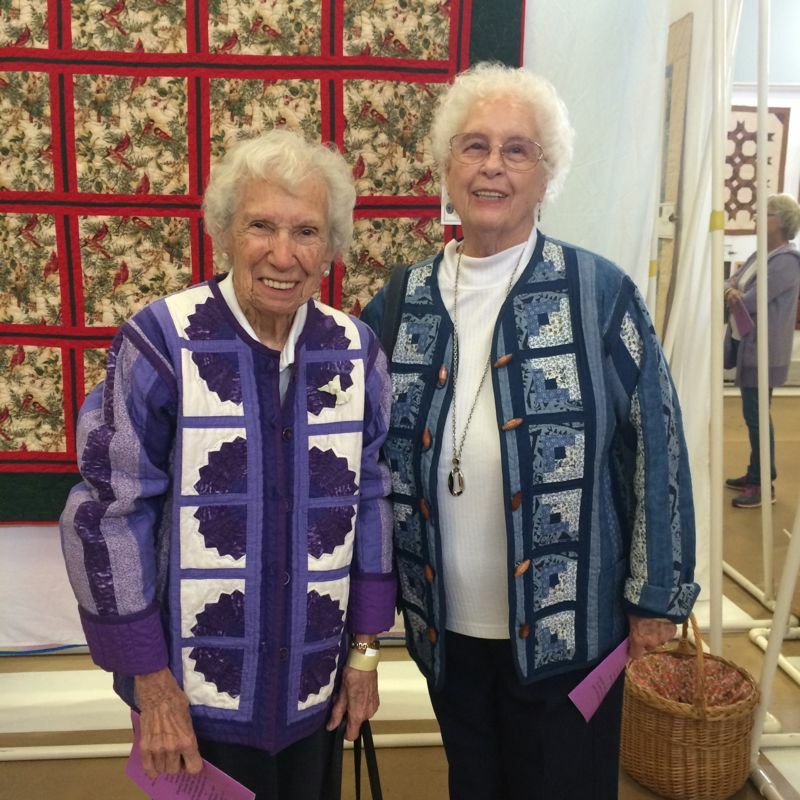 I thought these ladies looked great in their coordinating quilted jackets and they agreed to let me photograph them. 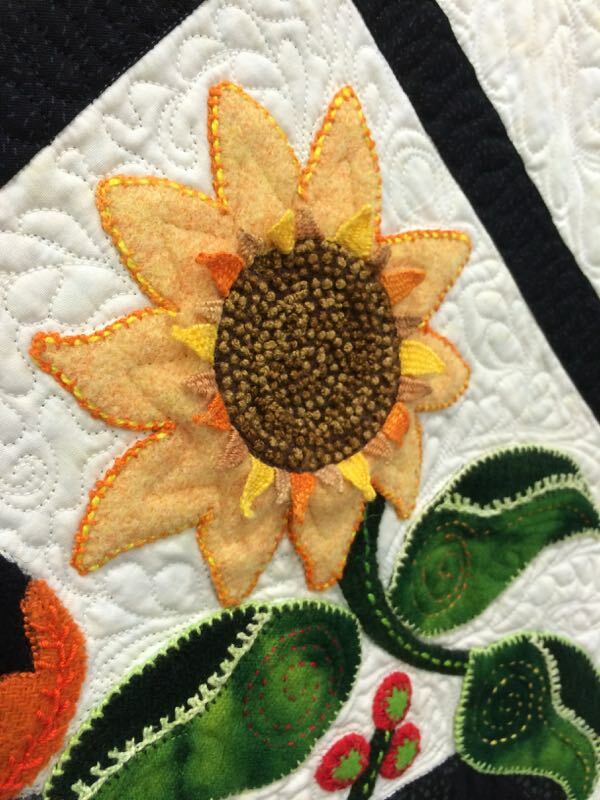 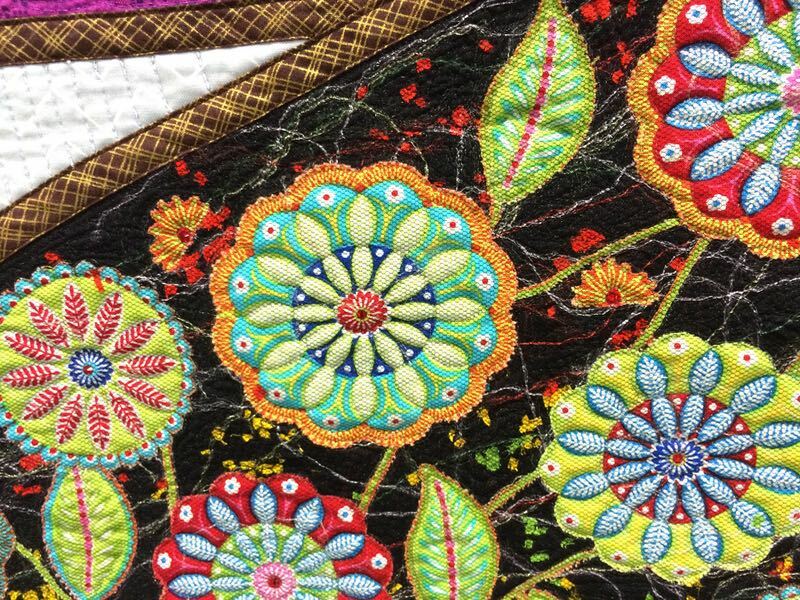 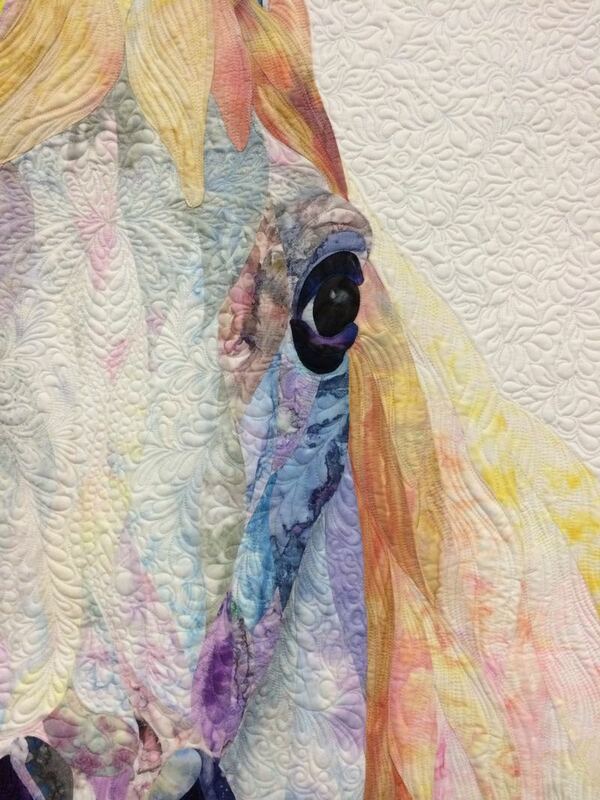 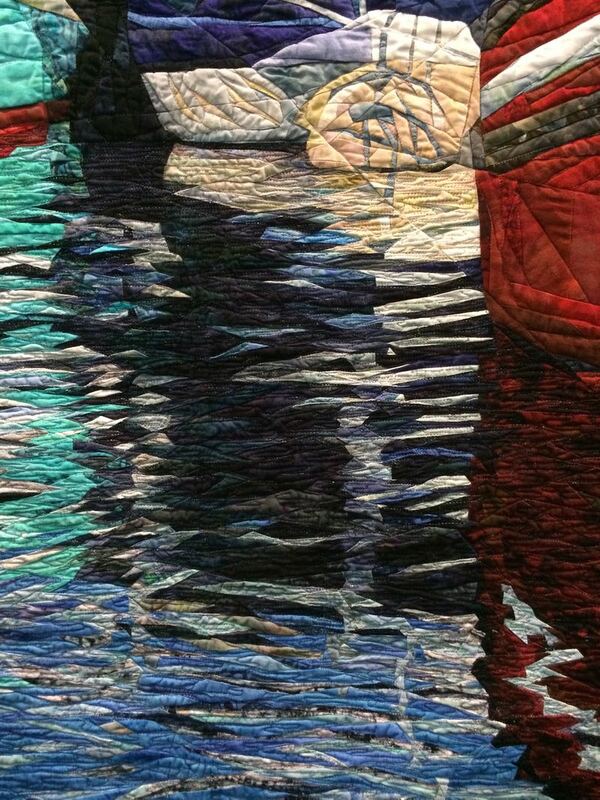 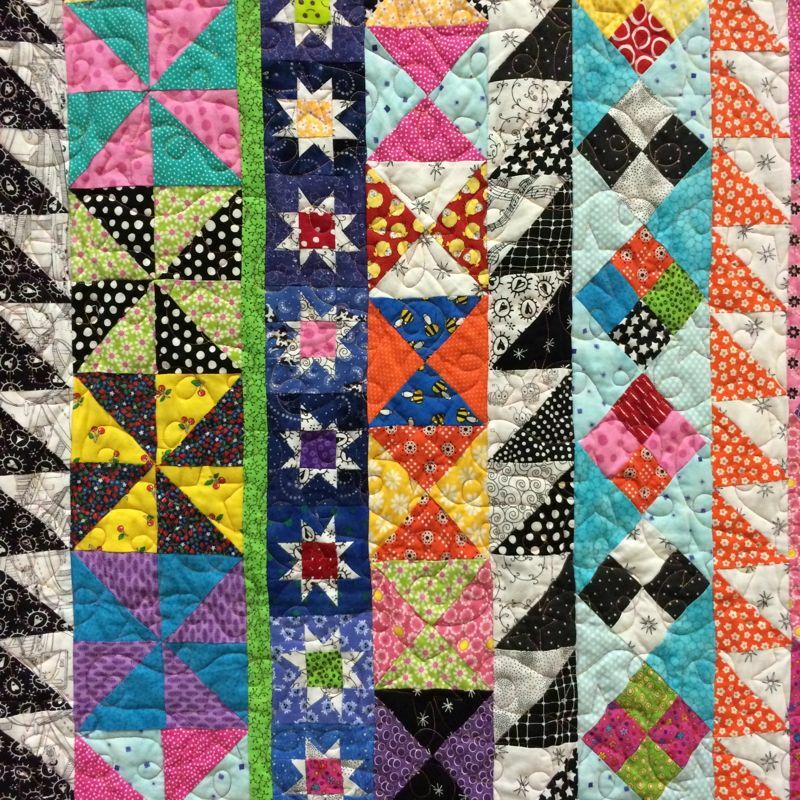 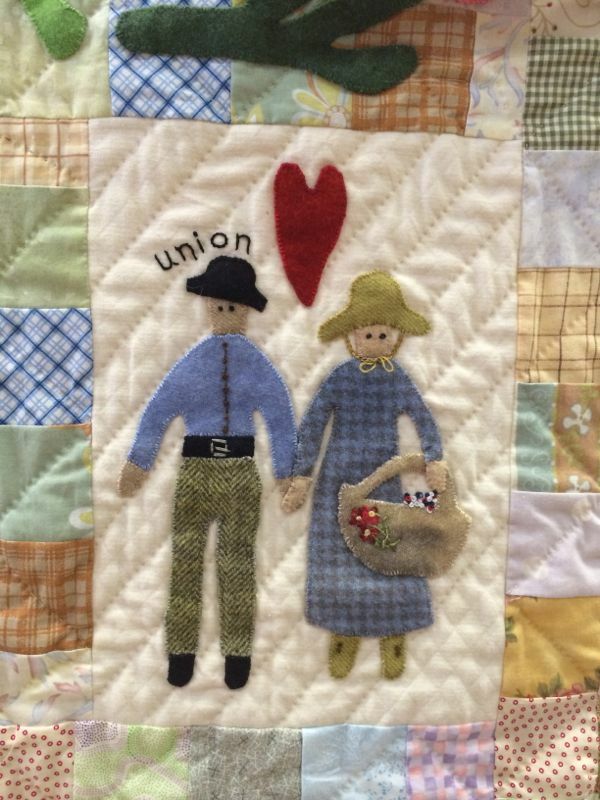 This is a detail from one of the beginner quilts that was displayed in this show, and they are all basically the same with different details. 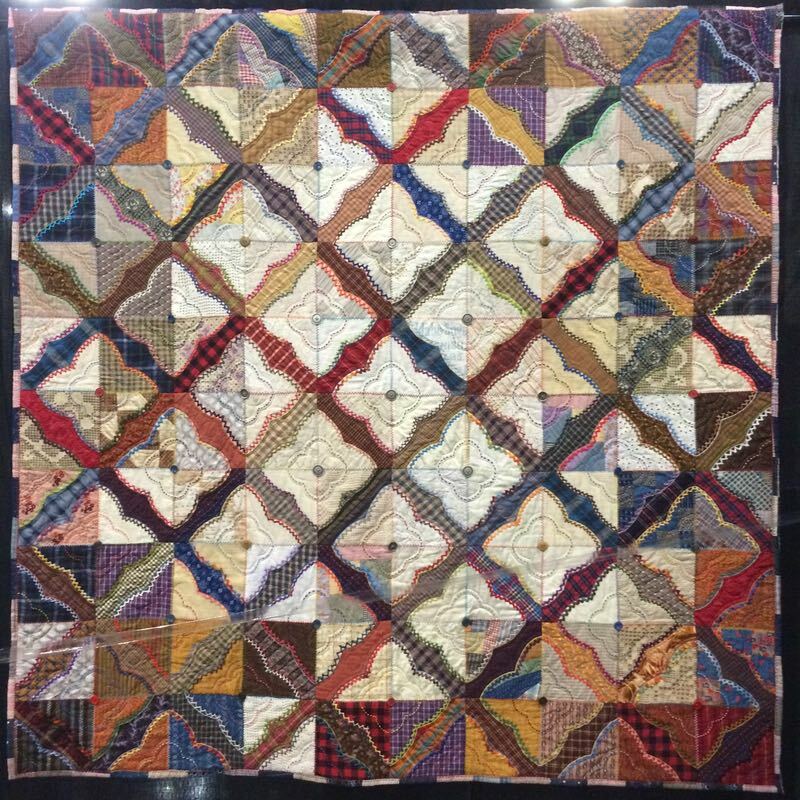 I couldn’t stop smiling as I looked at these quilts, for these young quilters were working hard to master the craft that I love so well. 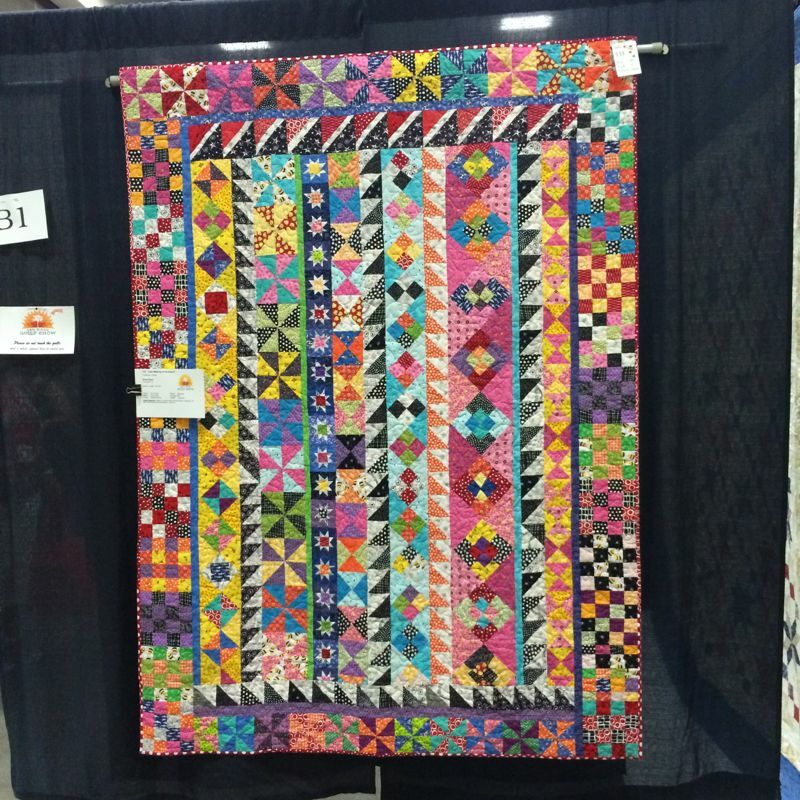 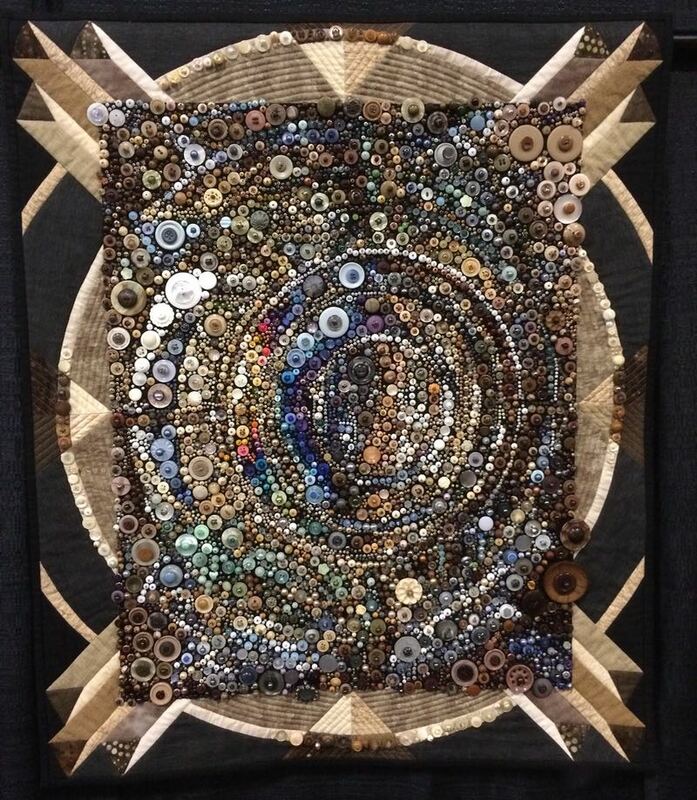 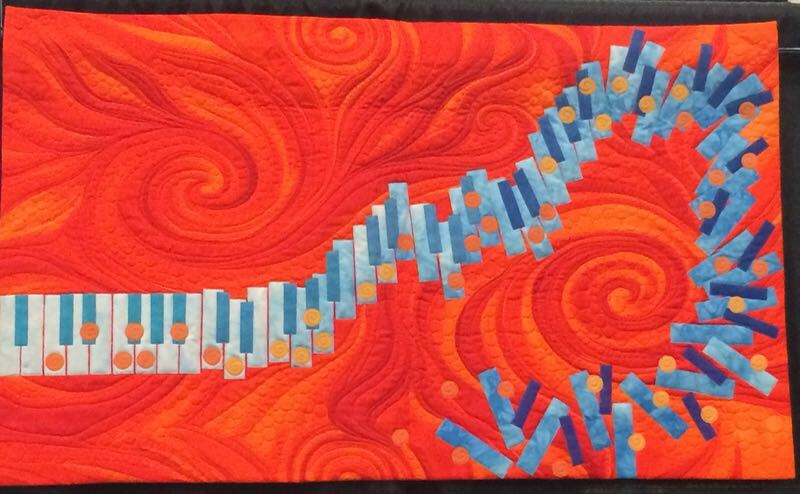 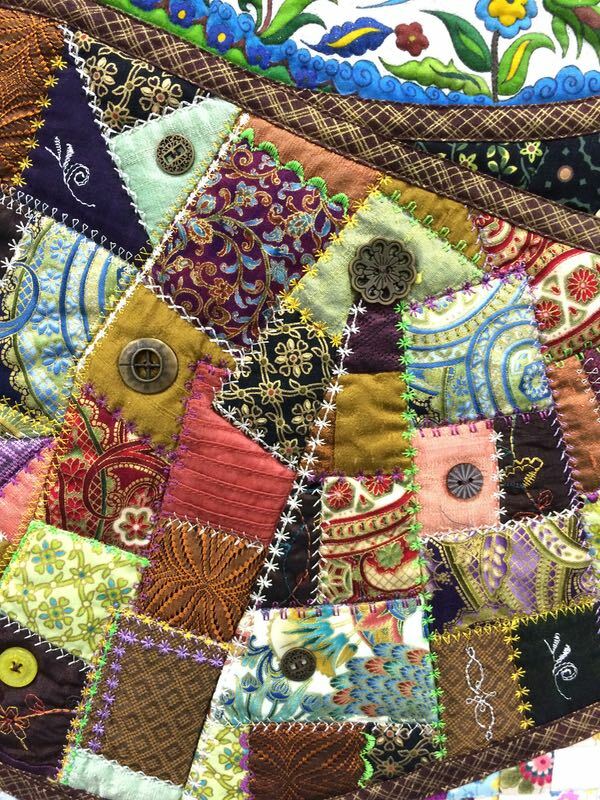 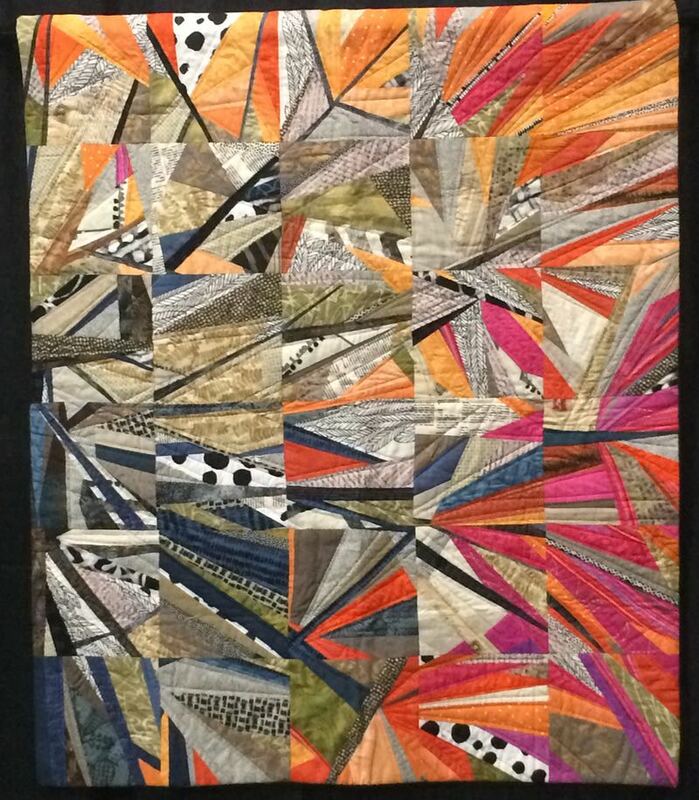 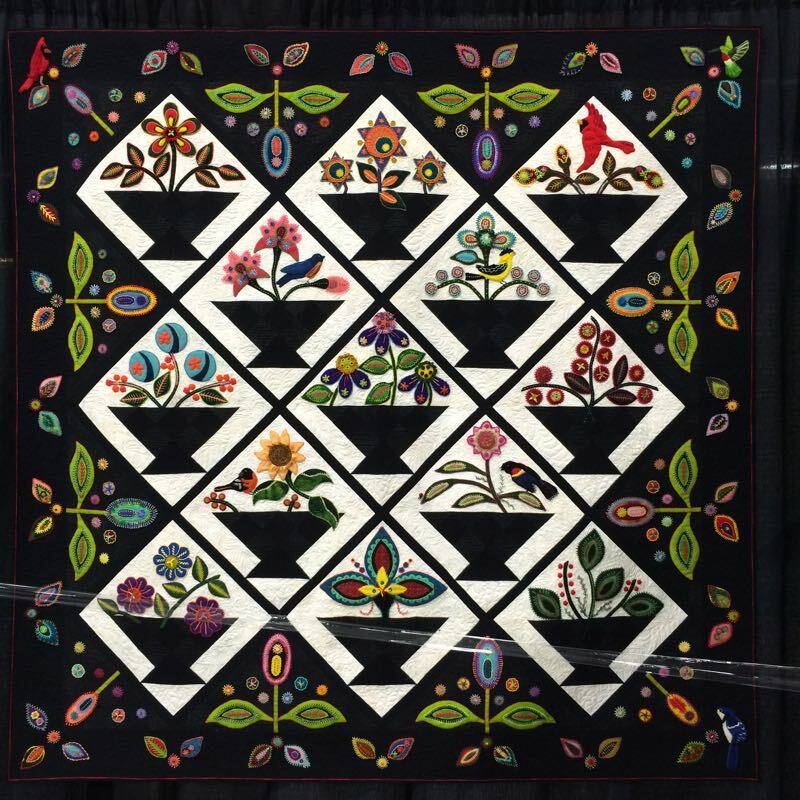 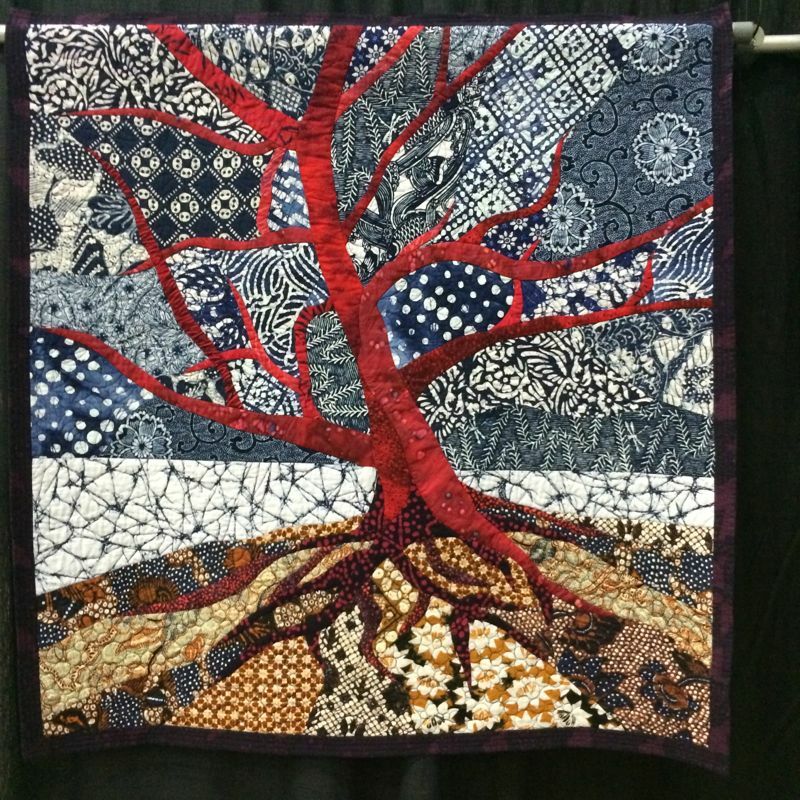 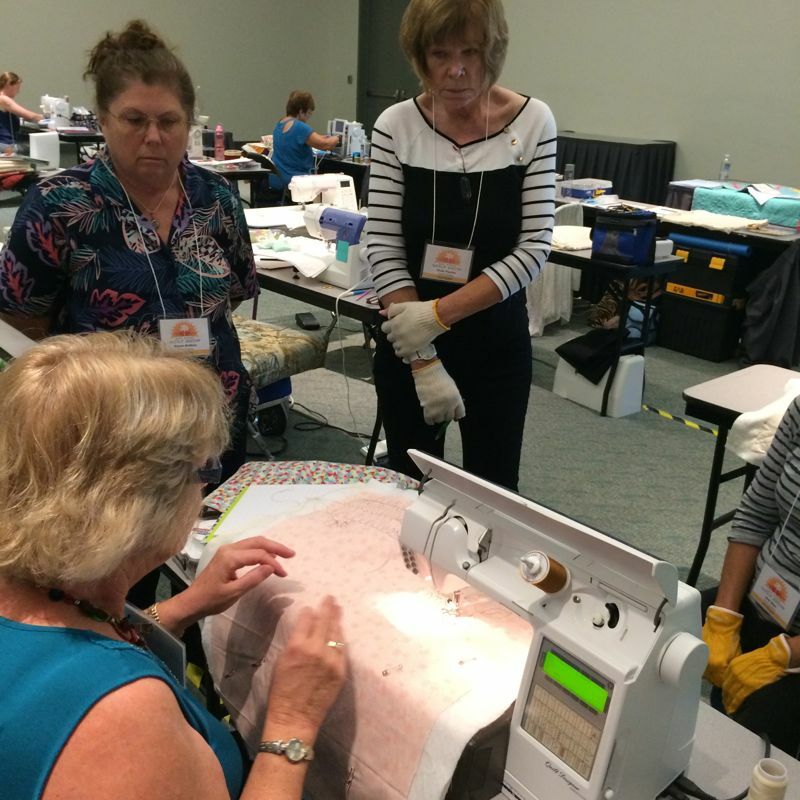 Some have thought that my choices of the Most Ugly Quilt at Road to California were a dagger to the heart of beginners, and some took me to task believing that we should never say anything bad about another creation. 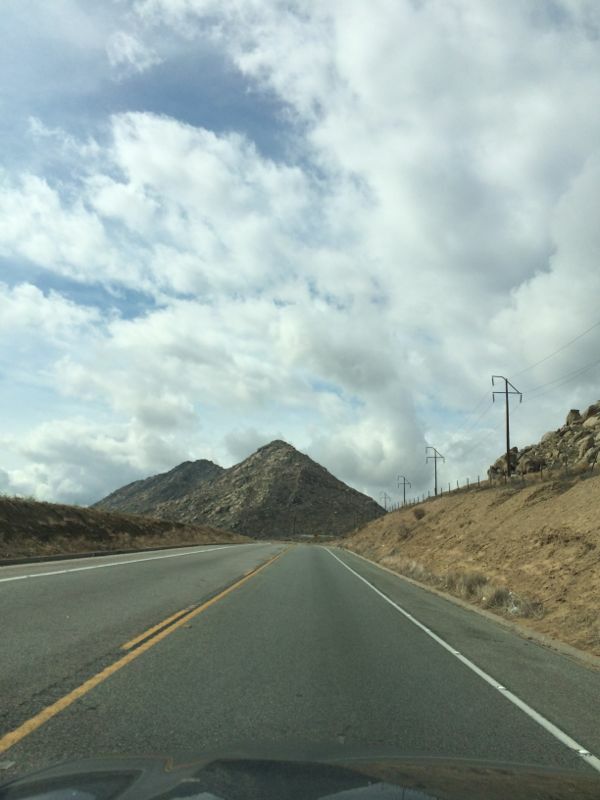 (I agree, up to a point.) 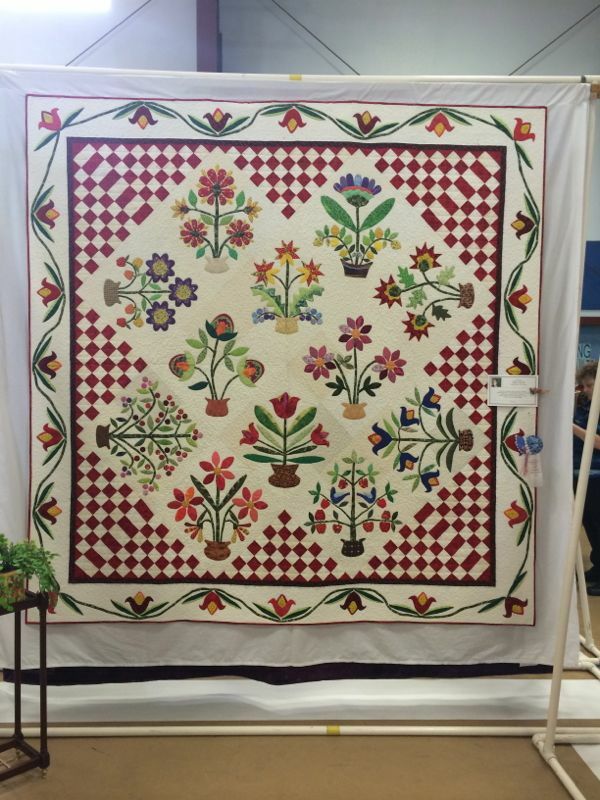 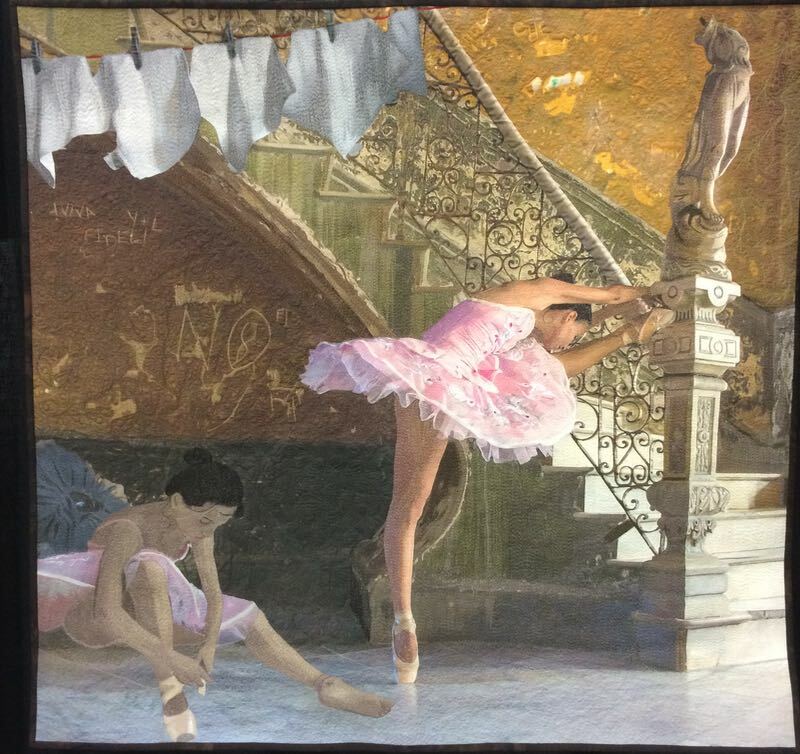 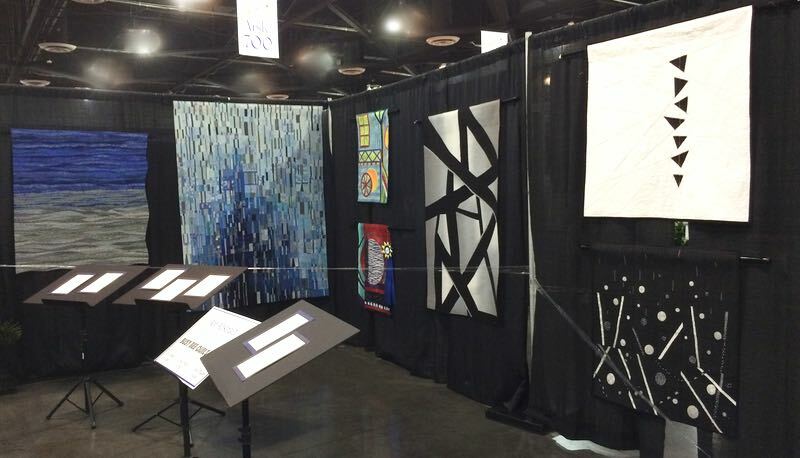 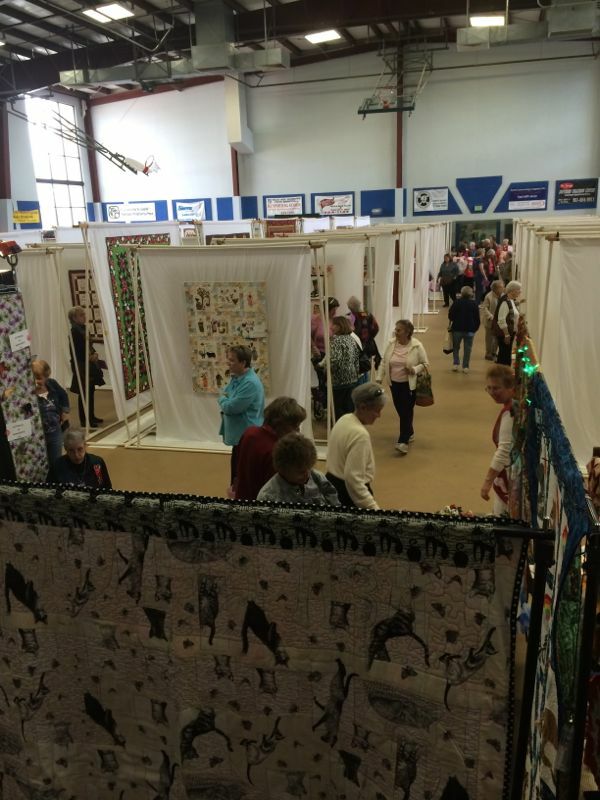 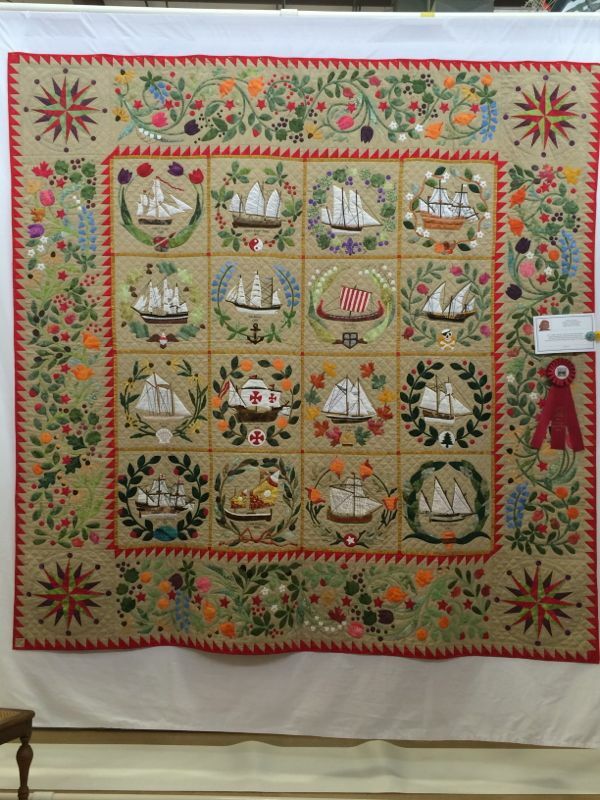 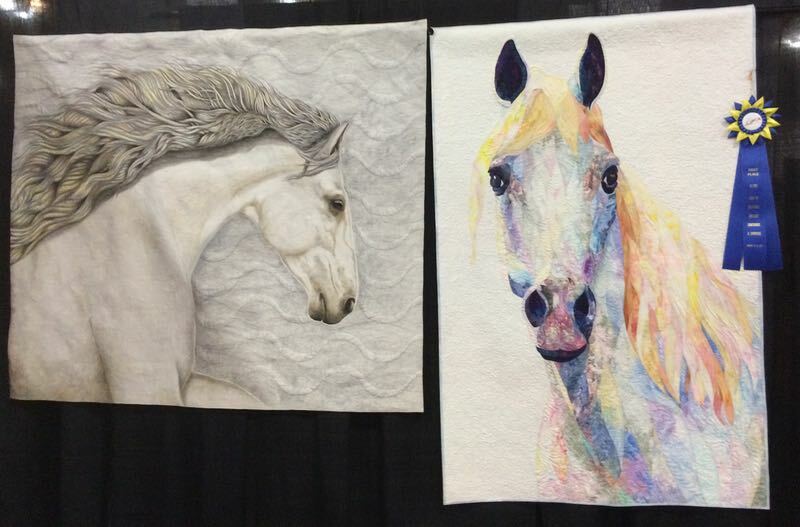 But beginning quilts should be in this type of show: a guild show, which displays a wide range of skills and talents. 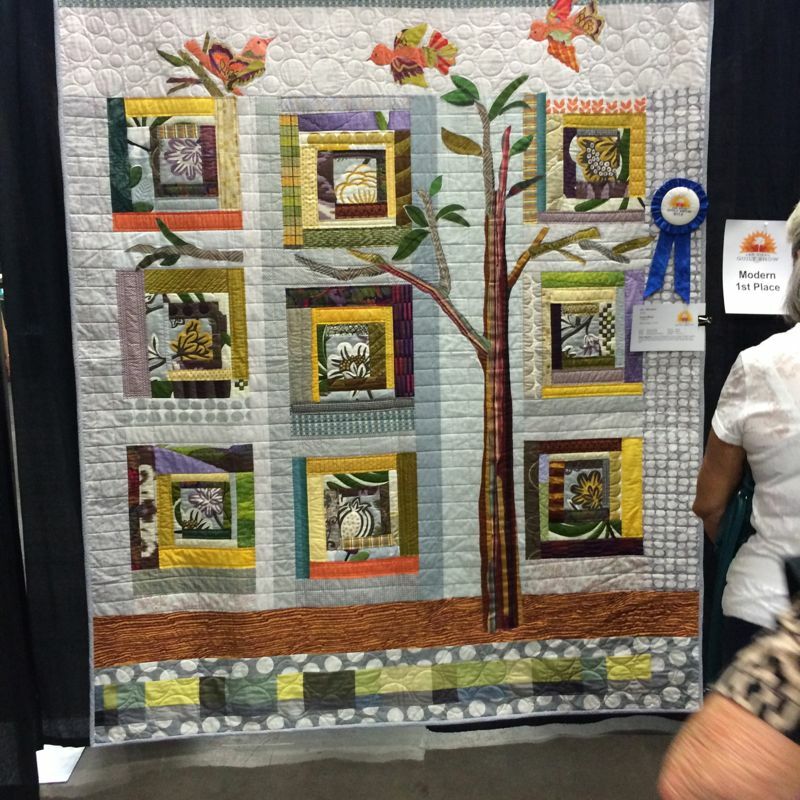 Beginner quilts do not really belong in a national juried show, unless they are working at a very high skill level, which my Most Ugly Quilts (MUQ) were not. 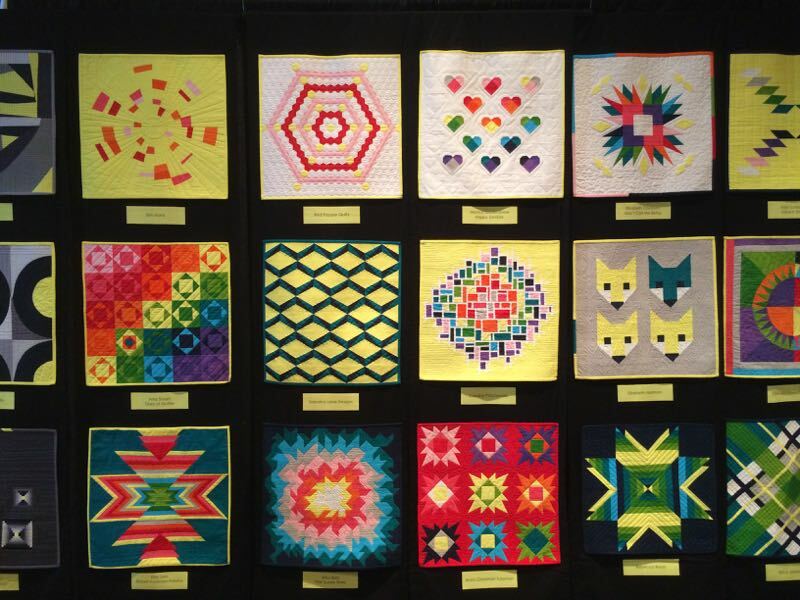 And all of these beginner quilts shown here are heads and shoulders above some of the MUQuilts, as they are authentic. 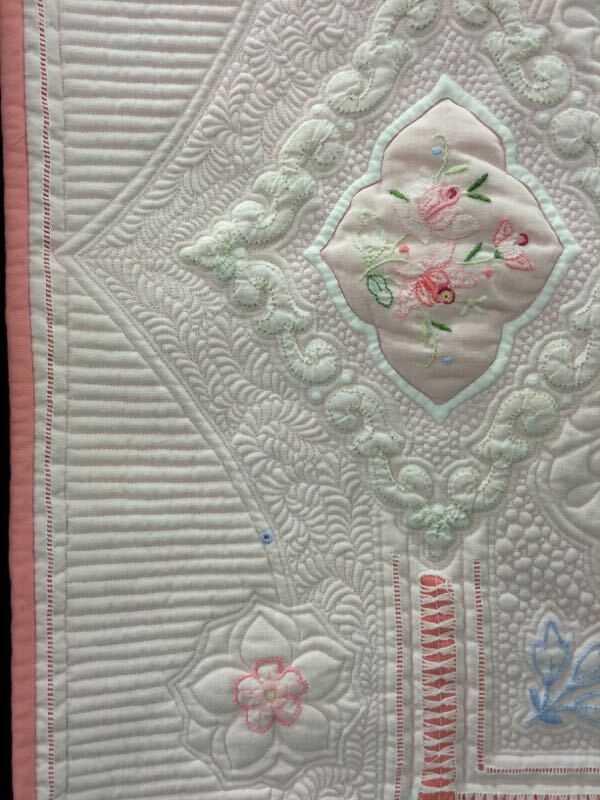 And charming. 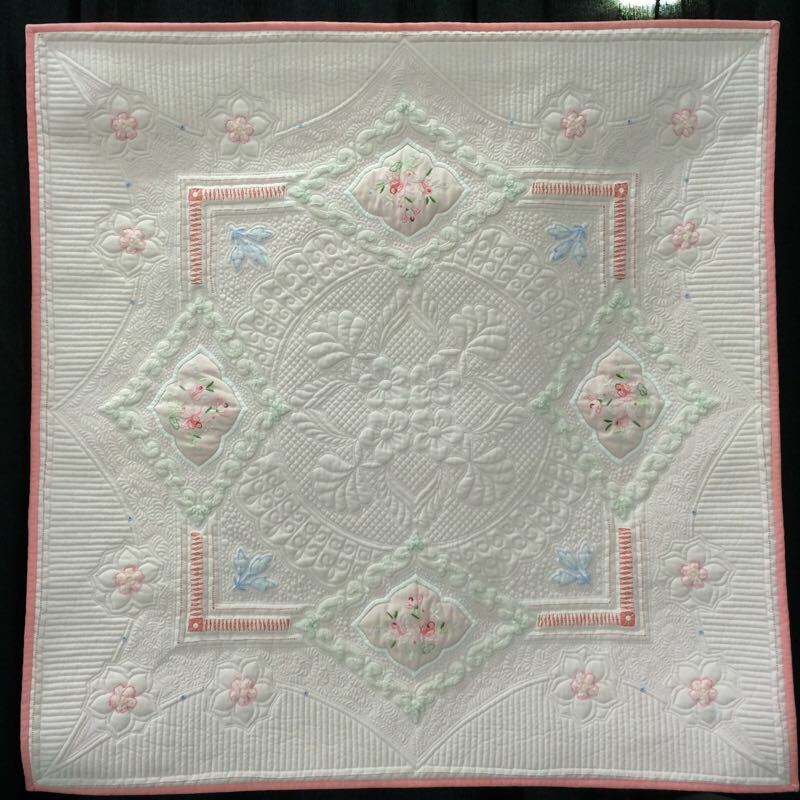 And well made with a central, balanced design. 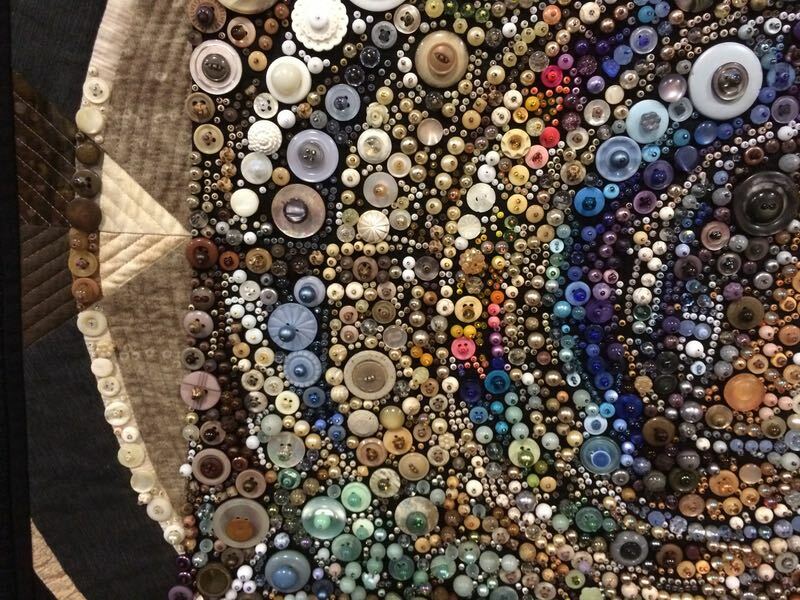 Mary Myers just happened to walk by her quilt, Circle of Hope, when I was looking at it. 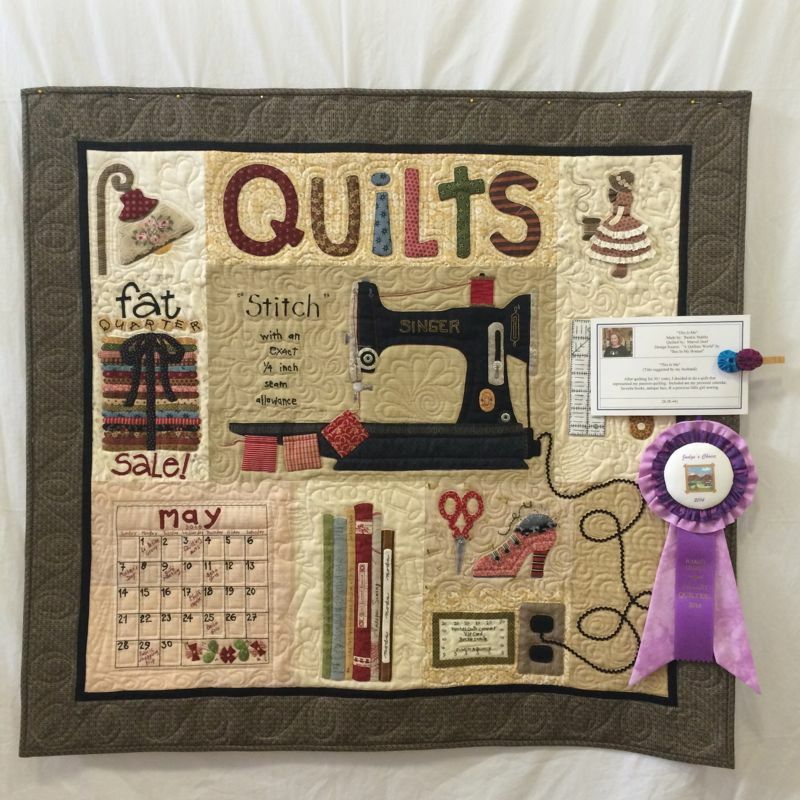 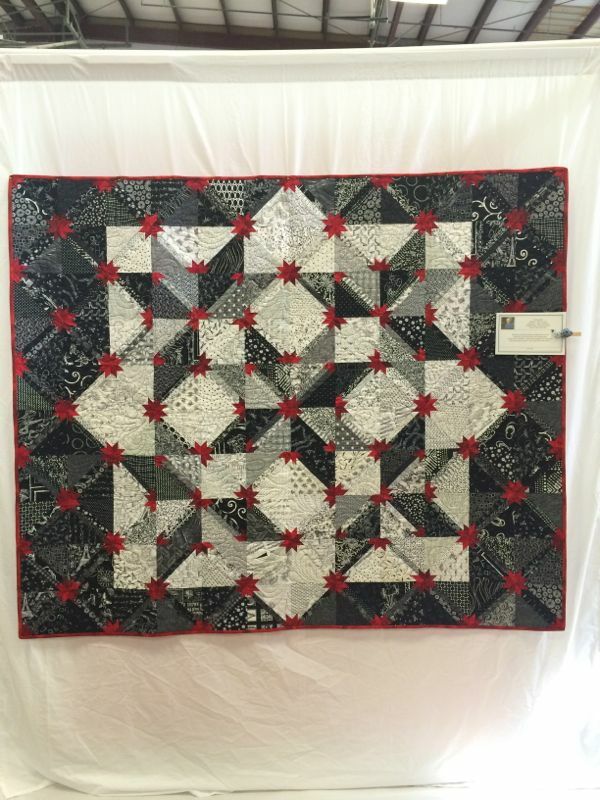 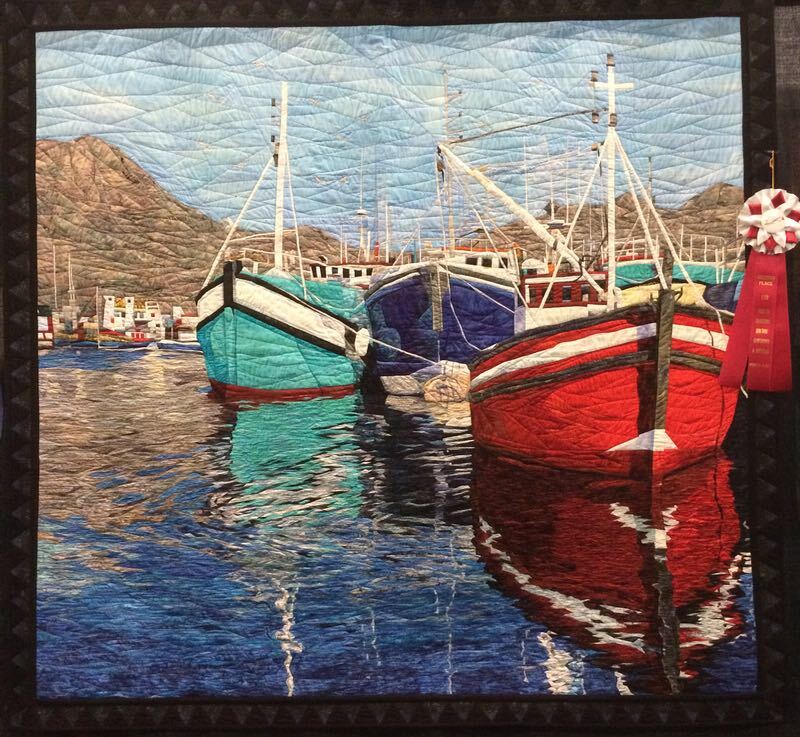 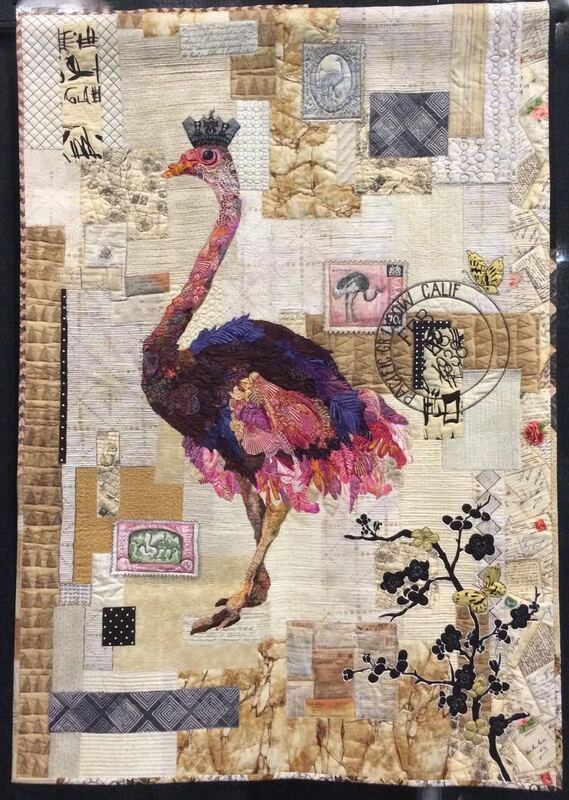 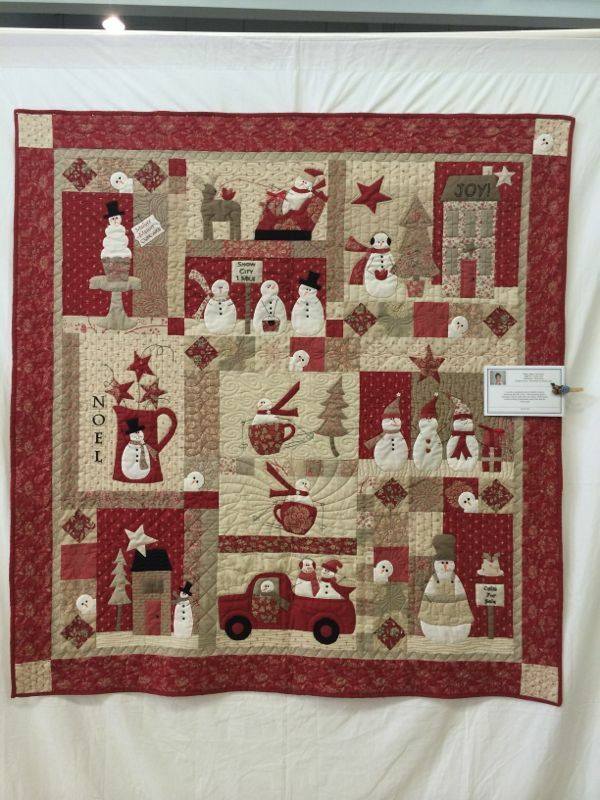 It’s quilted by Nancy Williams. 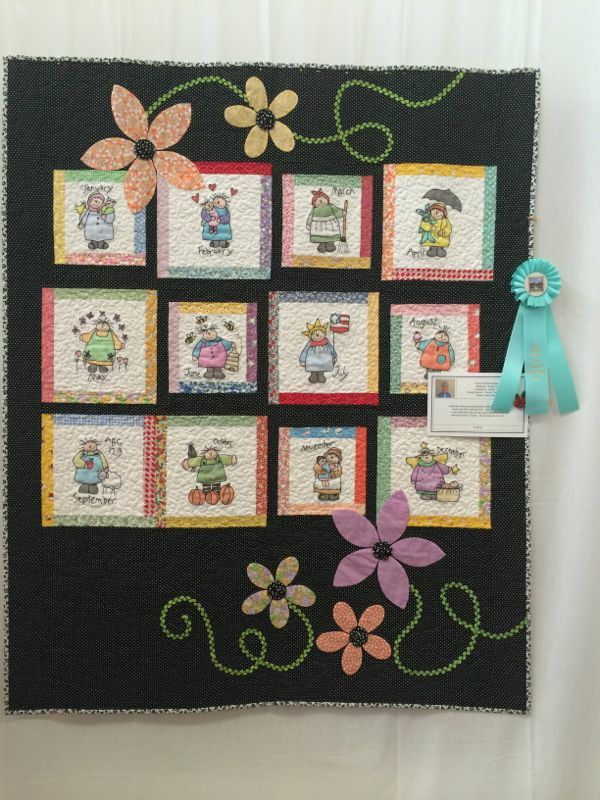 Wouldn’t you love to win this ribbon, with it’s tiny Sunbonnet Sue bonnet? 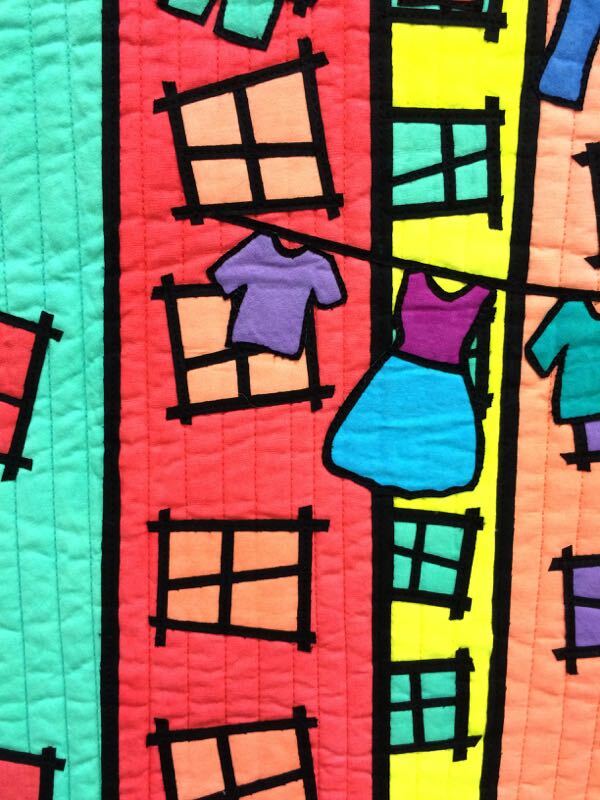 And don’t you love the little decorated clothespins with their colorful yo-yos? 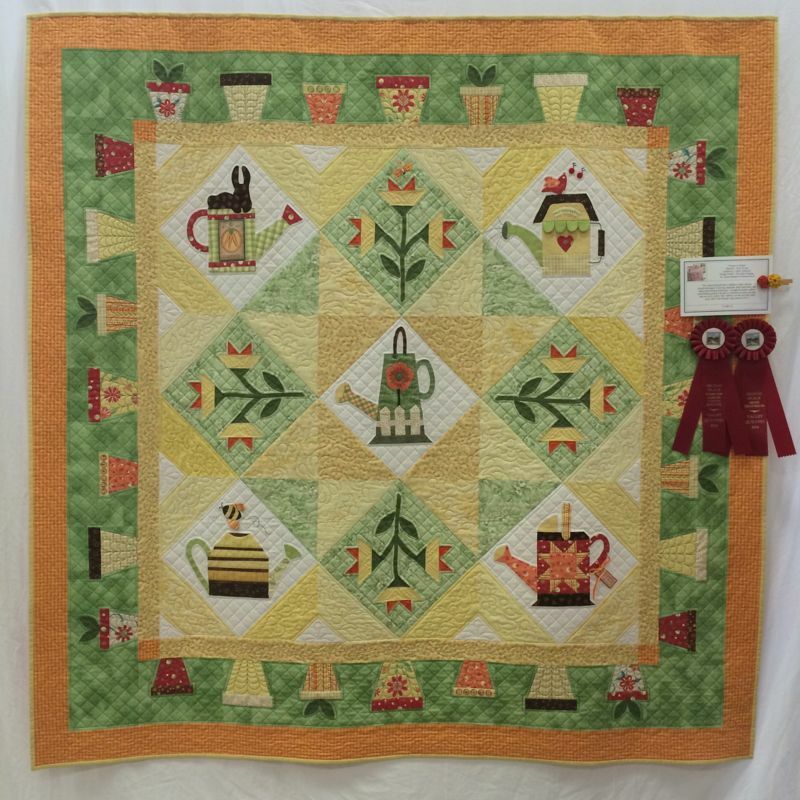 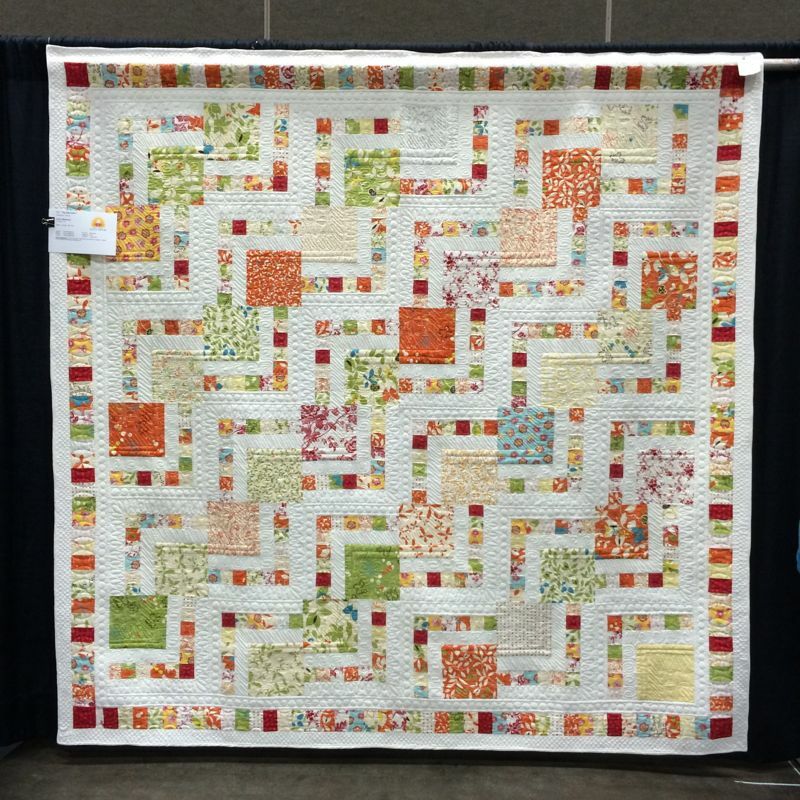 Green Tea and Sweet Beans was made by Susan Bailey and quilted by Laural Arestad, from a pattern by Jen Kingwell. 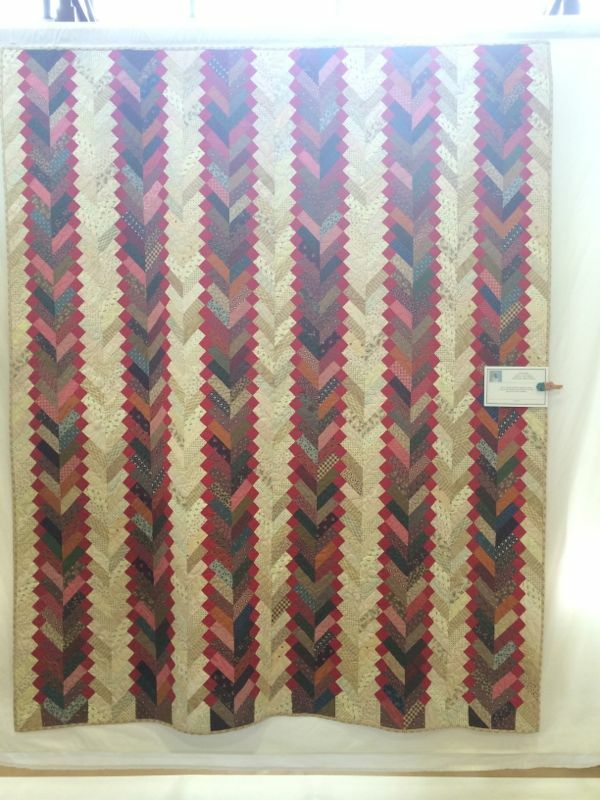 This, or a version of this, is definitely in my future. 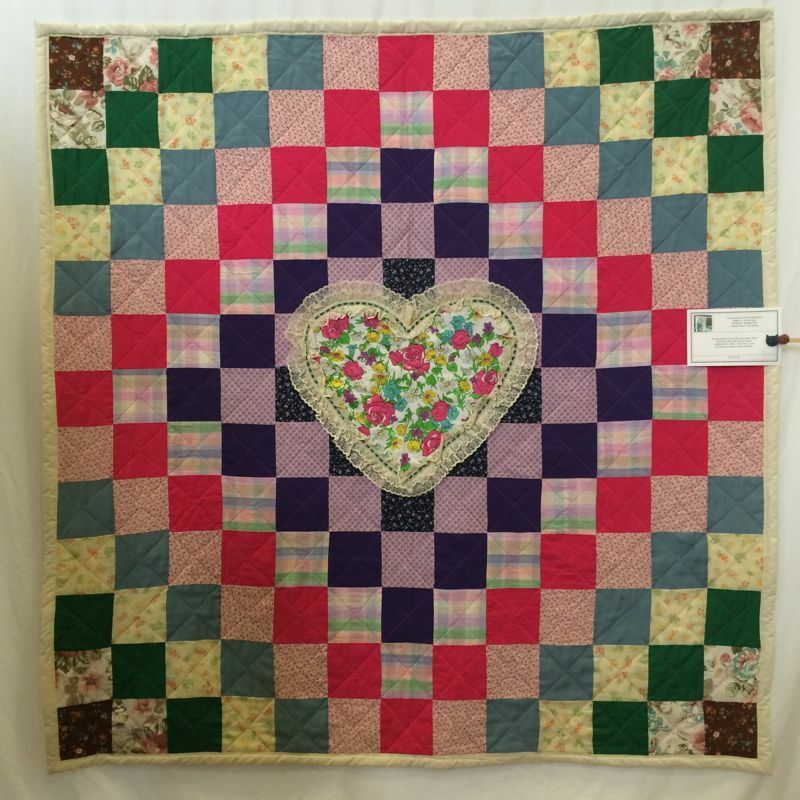 A lovely classic basket quilt. 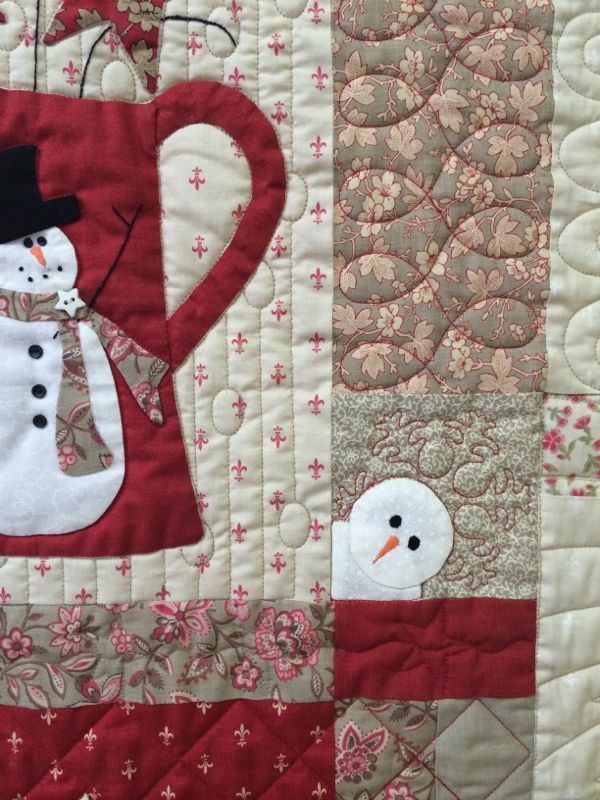 I loved the cute snowman peeking out from different places on this quilt (sorry, didn’t get the name). 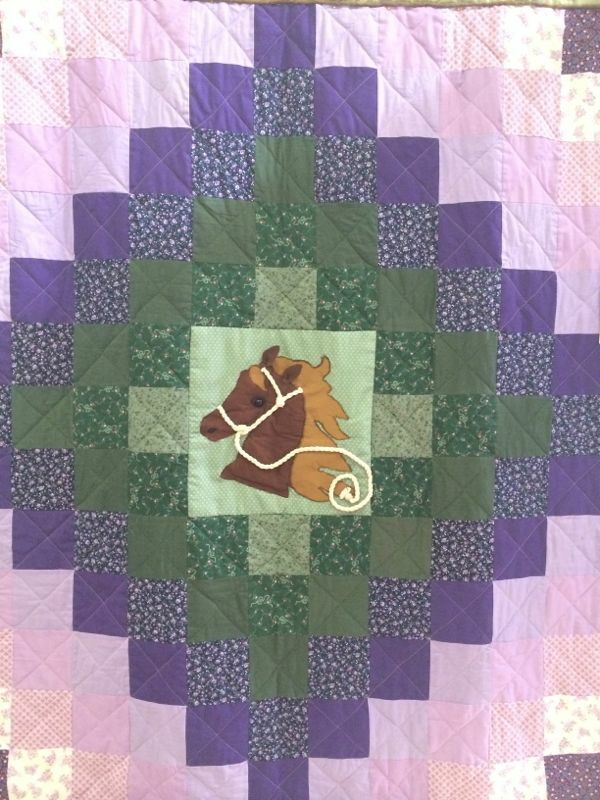 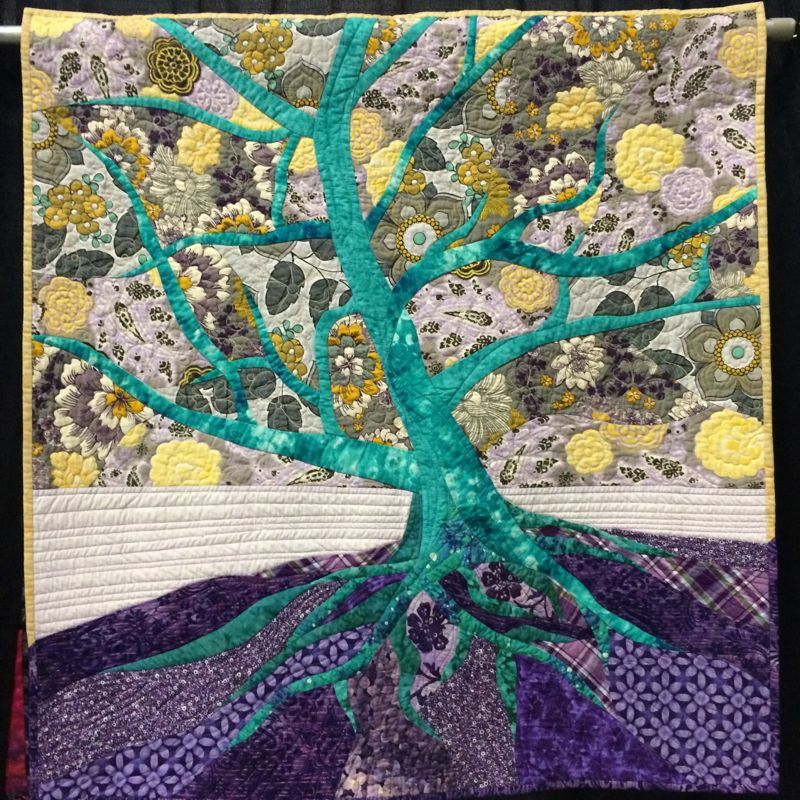 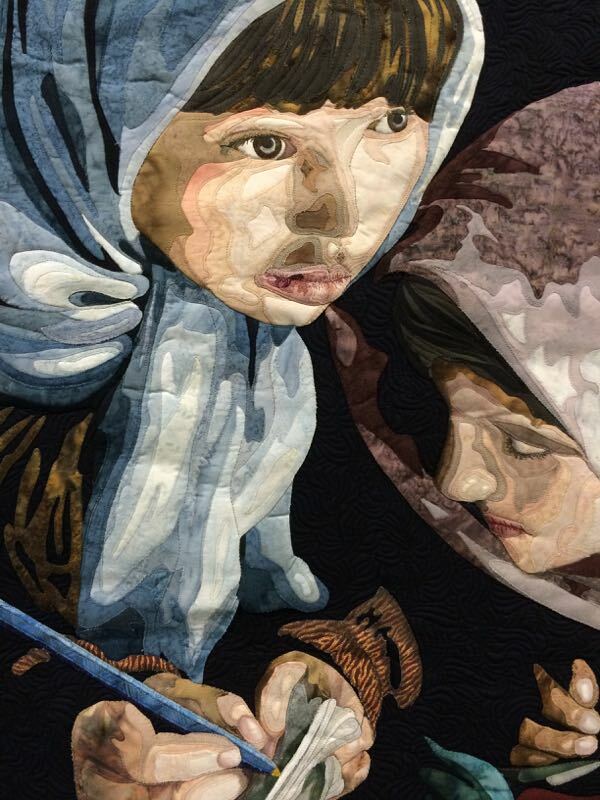 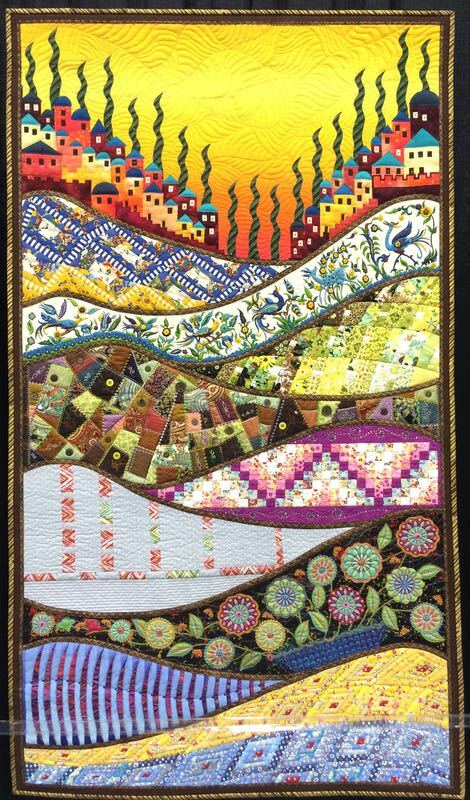 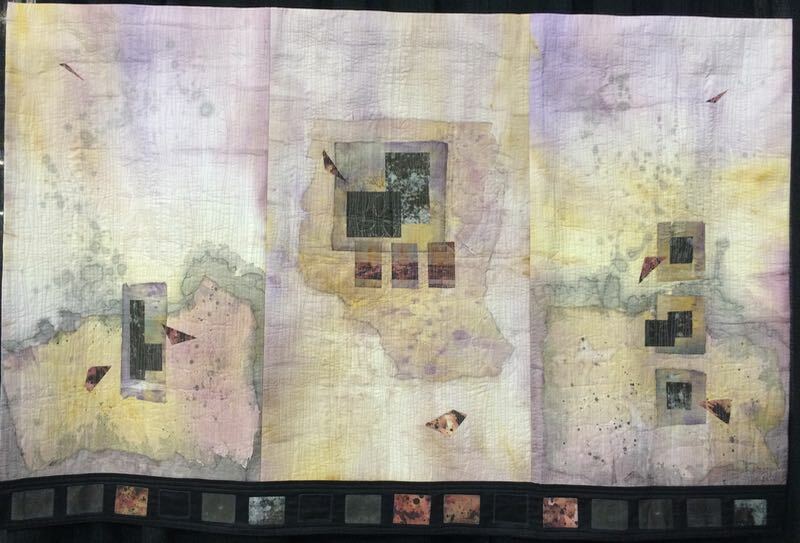 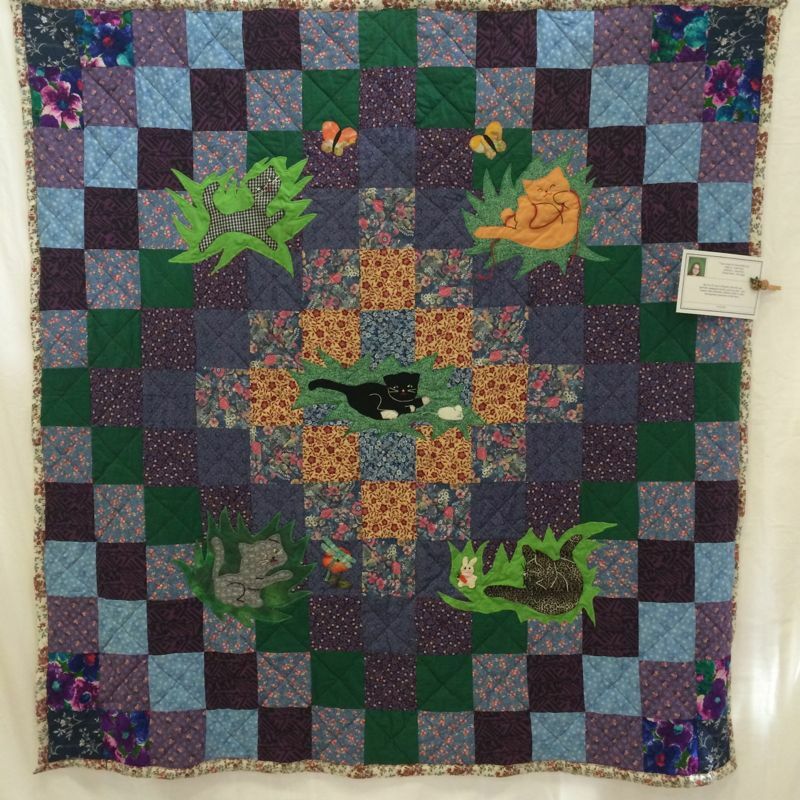 Thyme to Water was made by Alice Novak and quilted by Chuck Anderson. 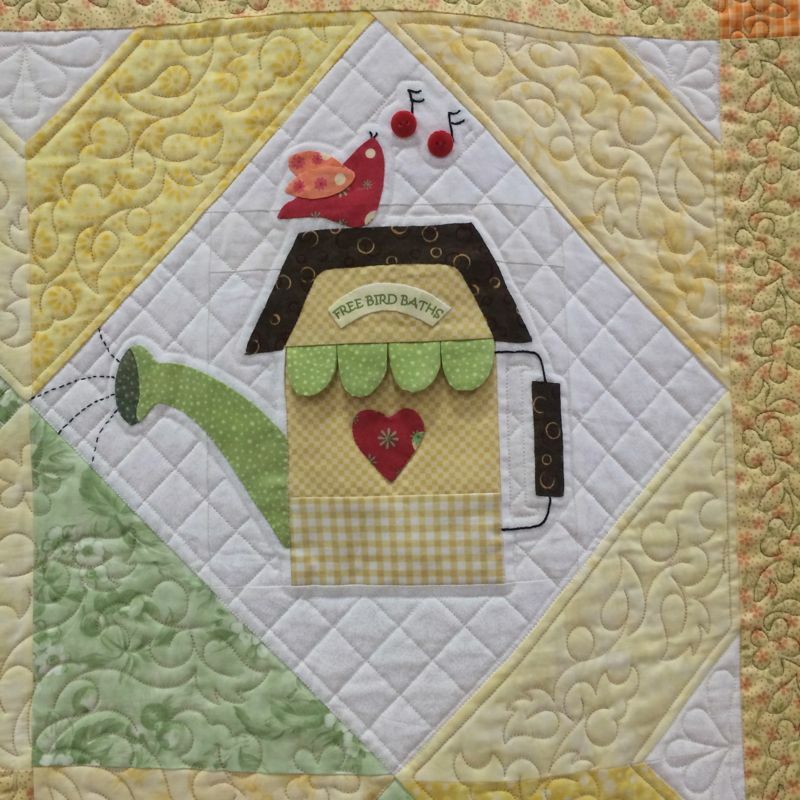 I loved the detail on her watering cans. 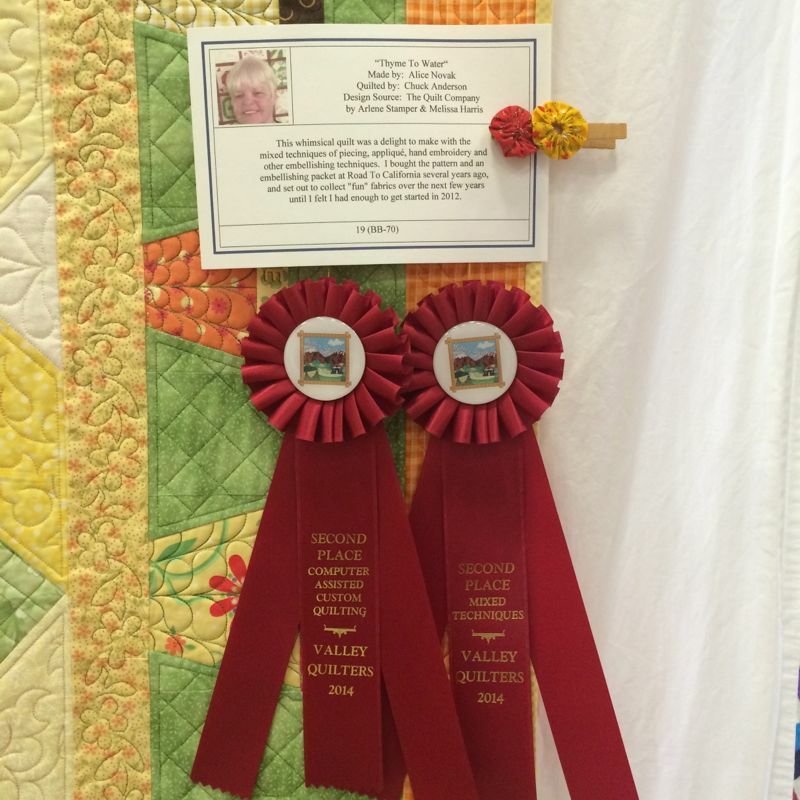 And check out those ribbons–TWO of them. 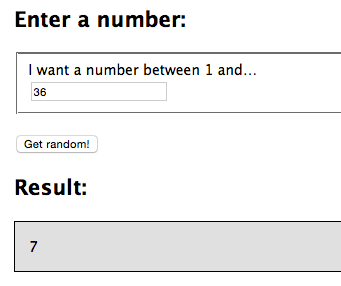 It was well deserved. 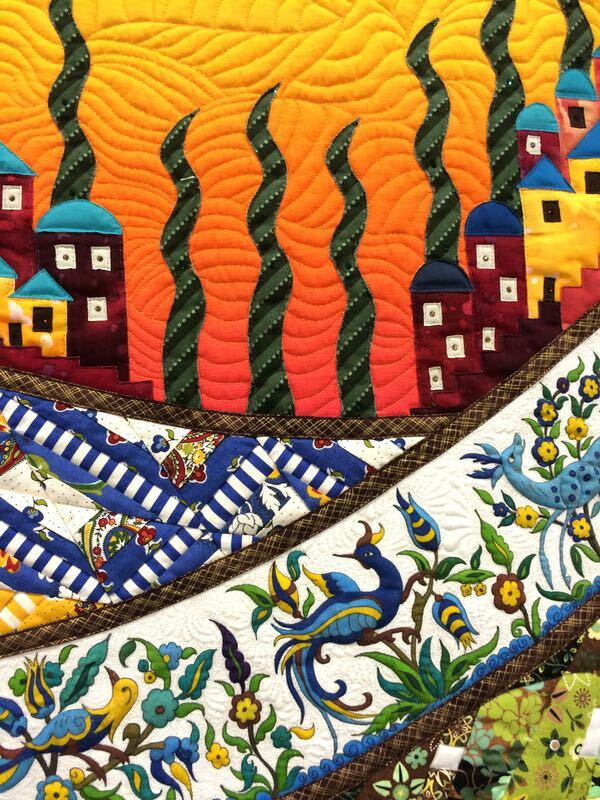 I just couldn’t get a good photo of this quilt, titled Pioneer Braid, but it was vibrant and colorful, as shown by the detail below. 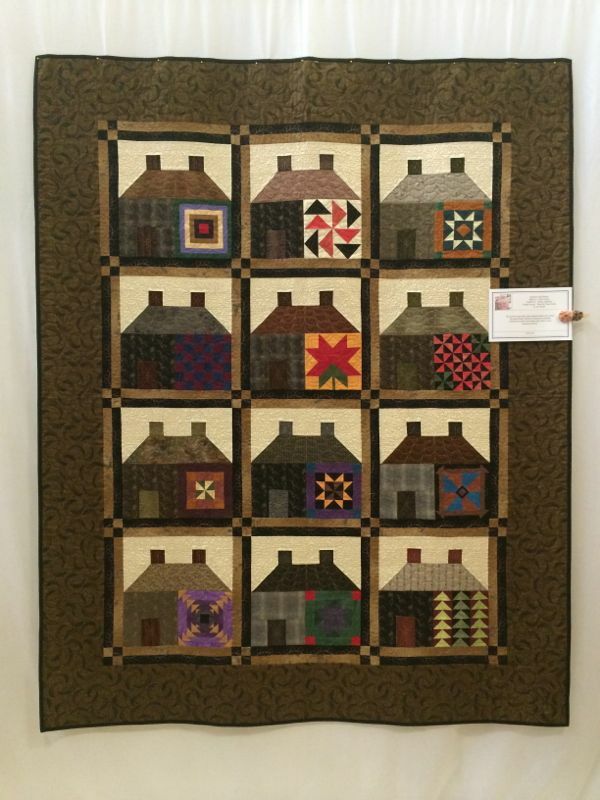 Jenelle Pickett made this quilt, and it was quilted by Nancy Williams. 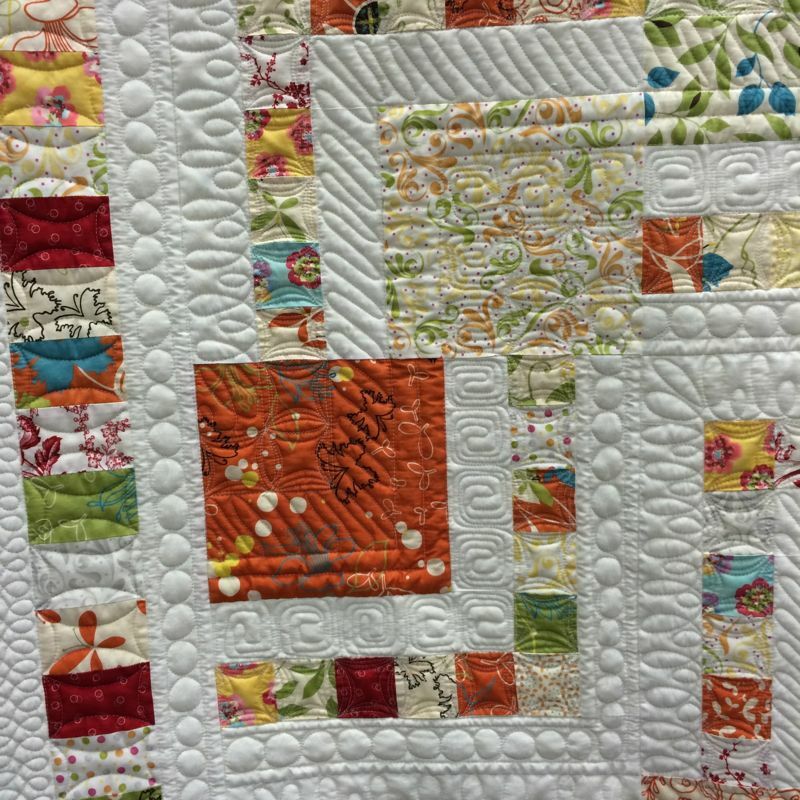 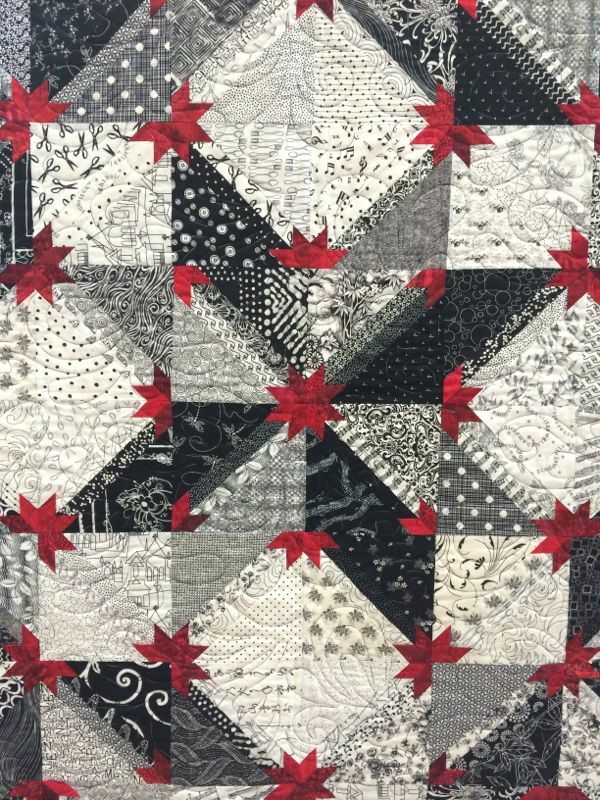 There is something so appealing about a scrappy quilt. 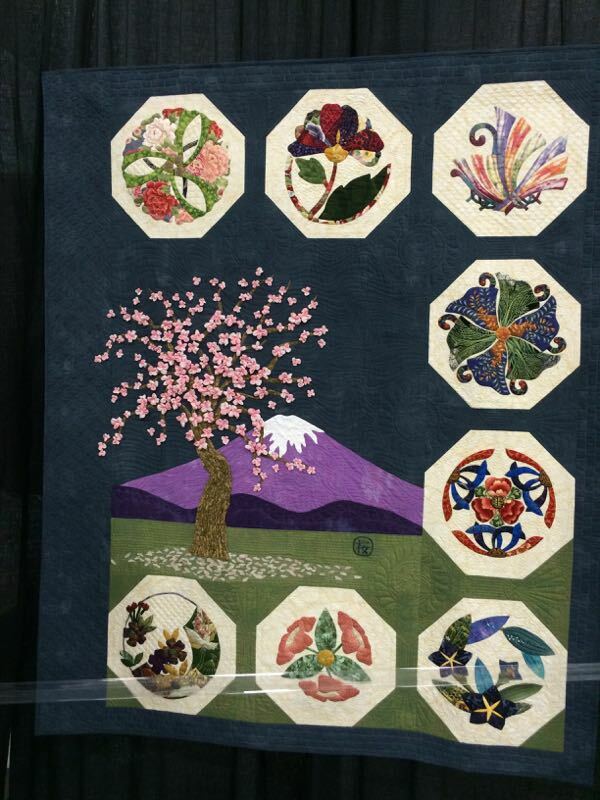 Japanese Quilt Shop is another quilt by the duo Alice Novak (maker) and Chuck Anderson (quilter). 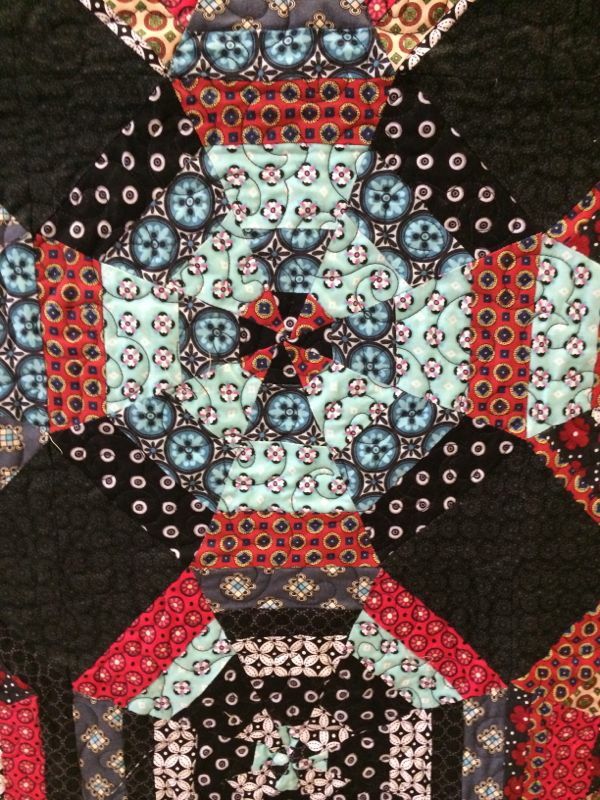 When I put this up on Instagram, I got a lot of questions about the pattern. 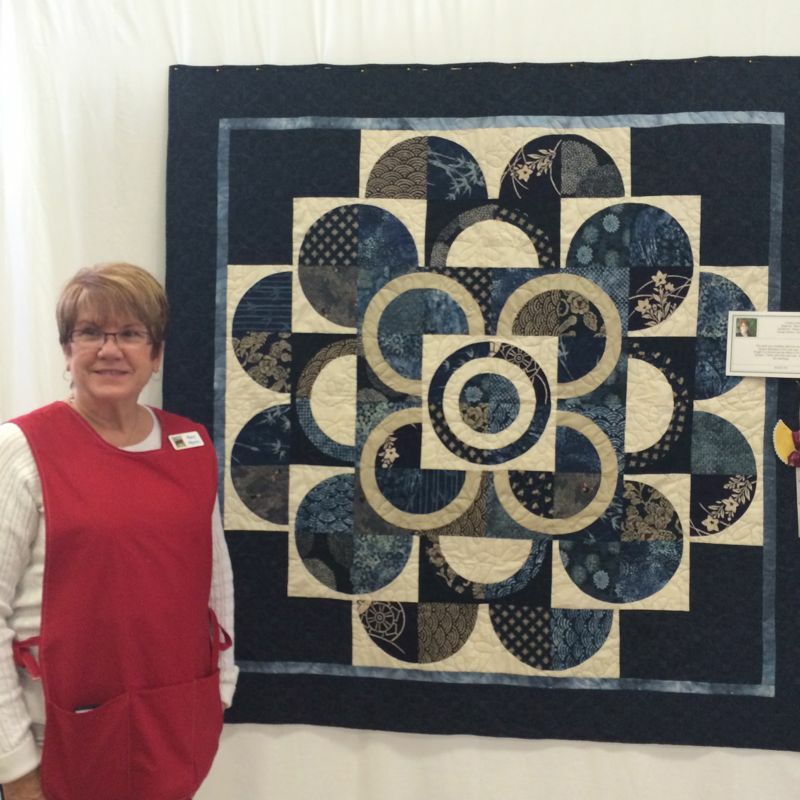 She credits her design source as Piece by Piece Quilts by Joe Wood. 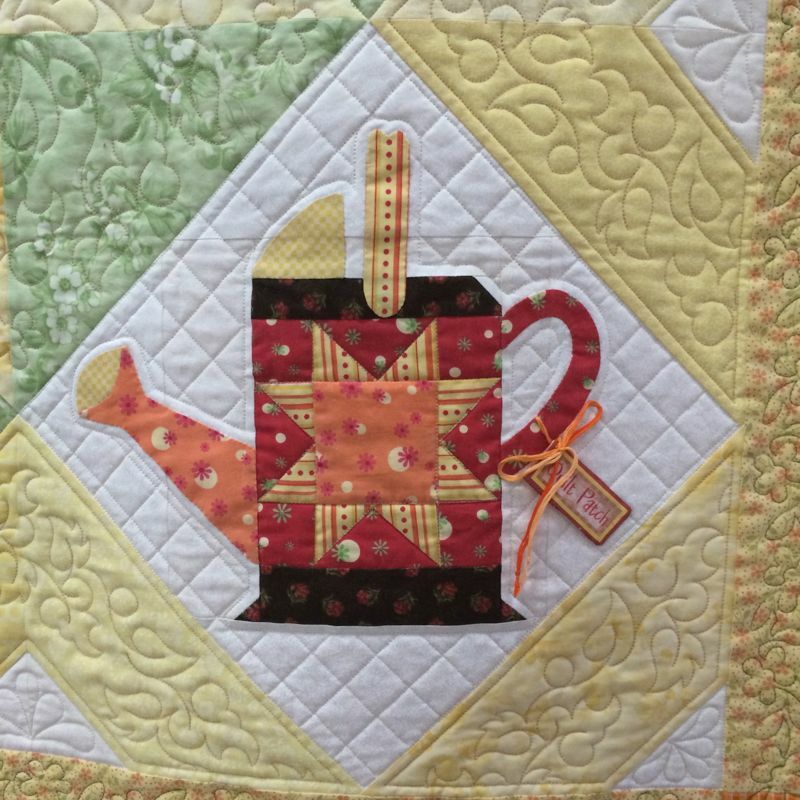 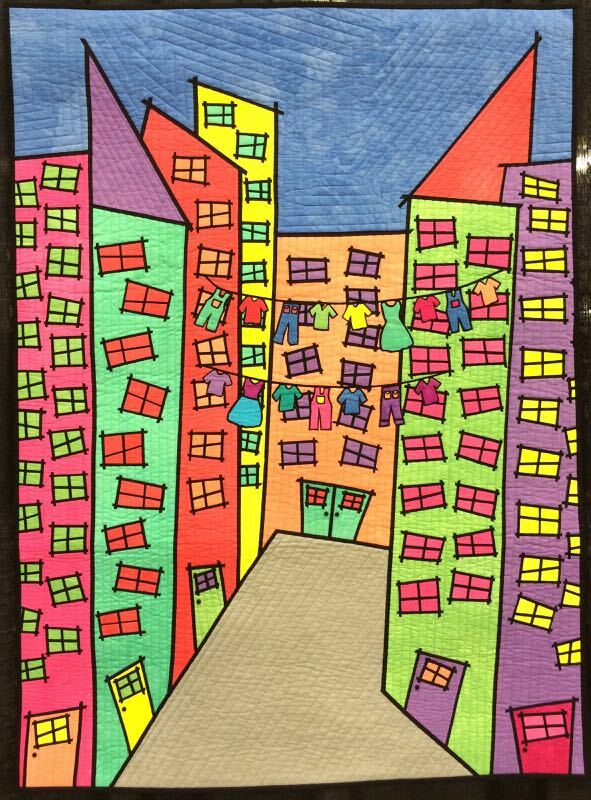 But Barbara Brackman, on her blog, has a free pattern that may work for you, if you substitute in a quilt block or two in the houses. 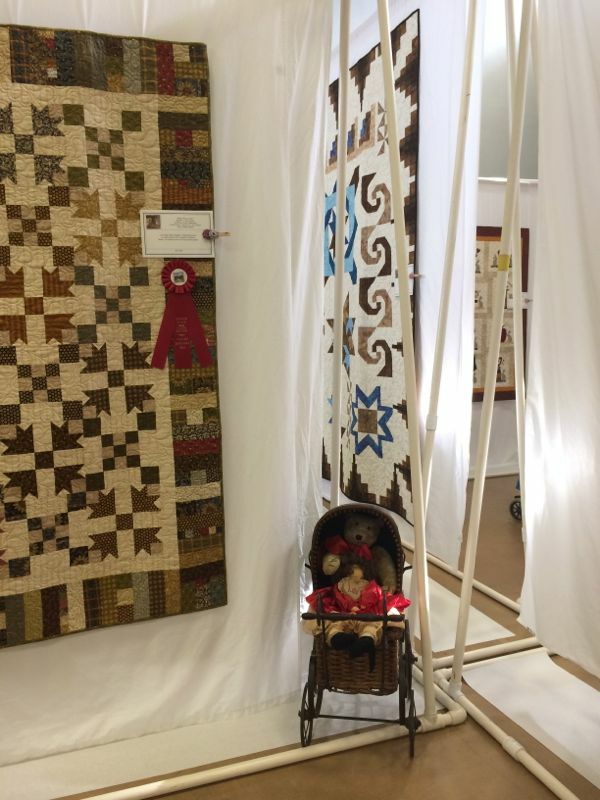 There was obviously a lot of tender loving detail given to this small show, as witnessed by this antique stroller filled with dollies. 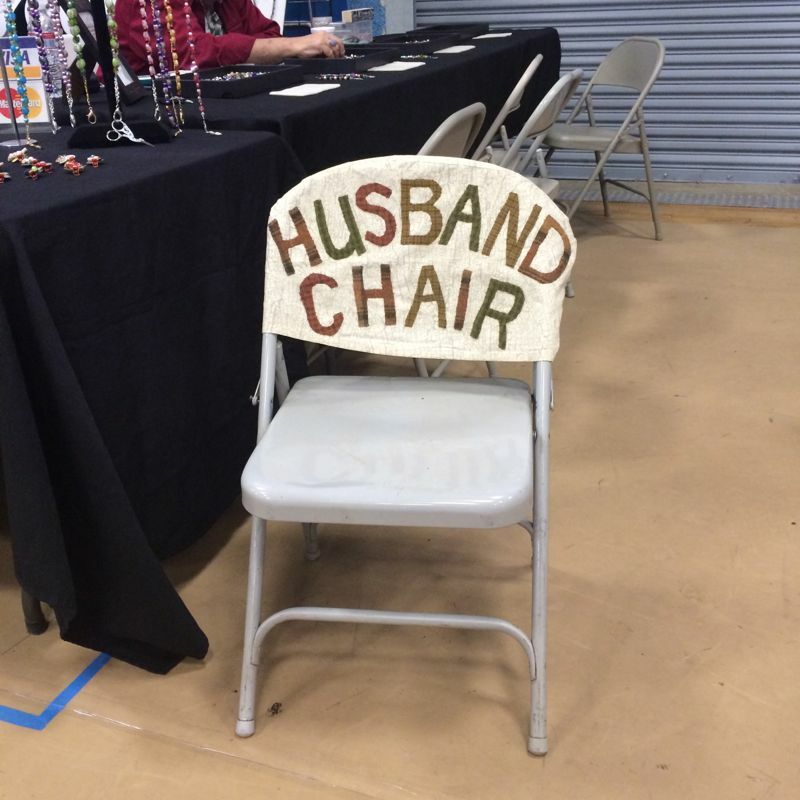 There were even a few vendors, and this great chair at one of their booths. 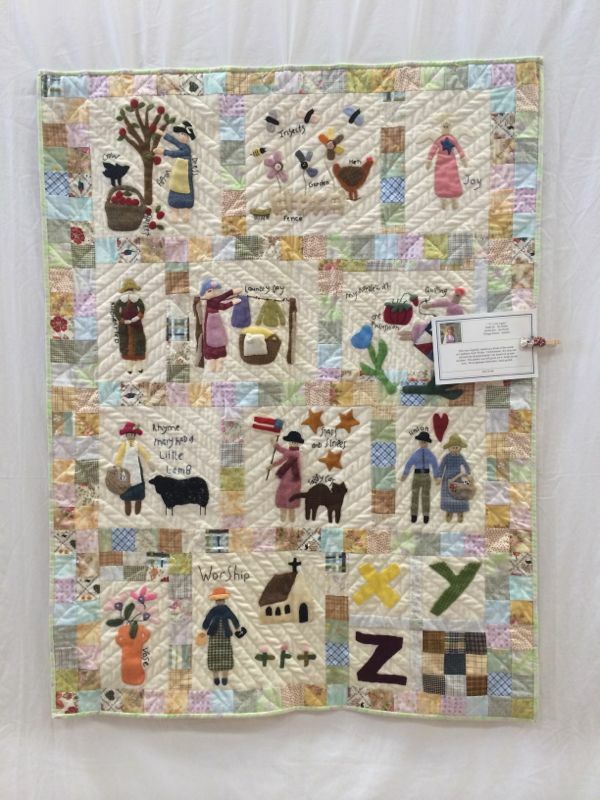 Jan Dolan’s “A” is for Apple was a lovely gathering of alphabet representations. 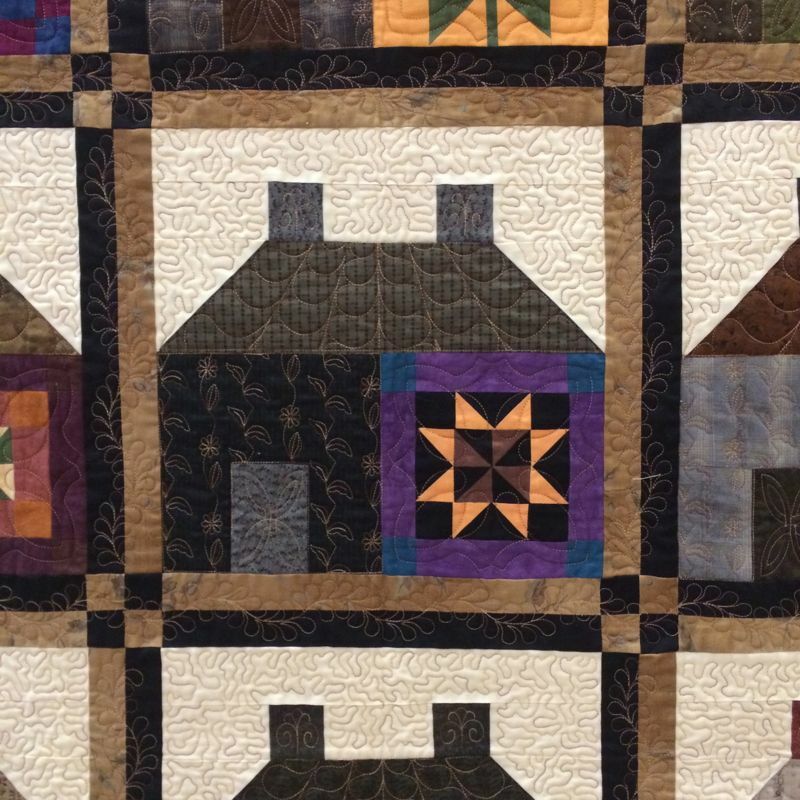 The story of the quilt is complicated: it was originally started as a block-of-the-month at one shop, but the shop was sold and the designer/teacher was injured in an auto accident. 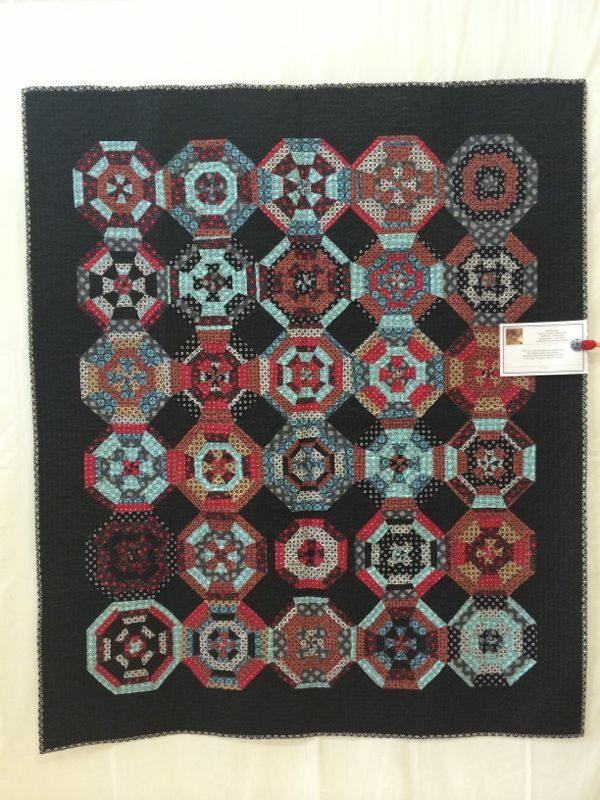 The pattern was still given out to finish on their own. 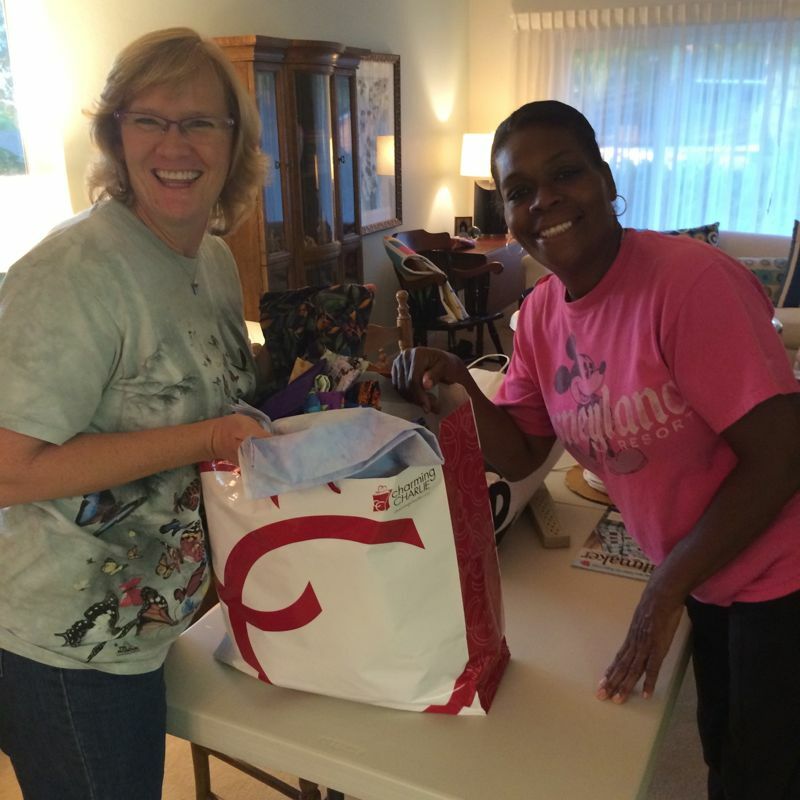 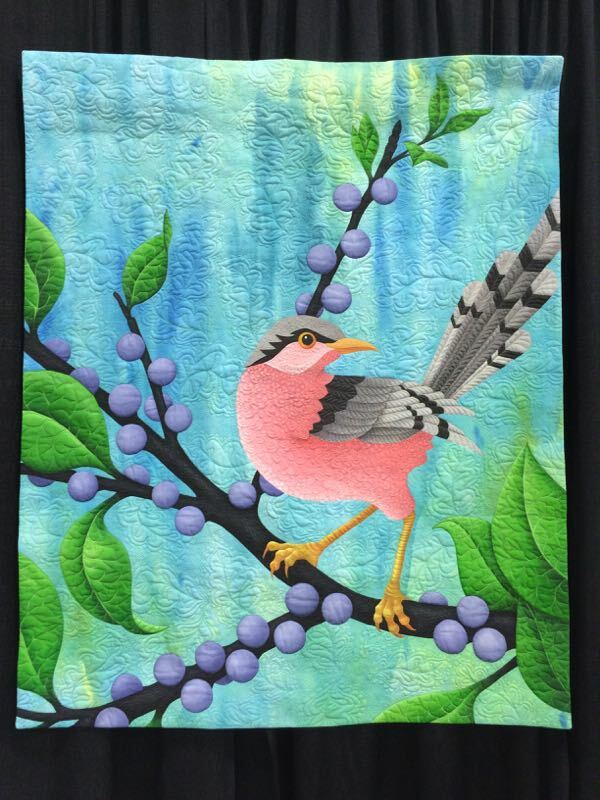 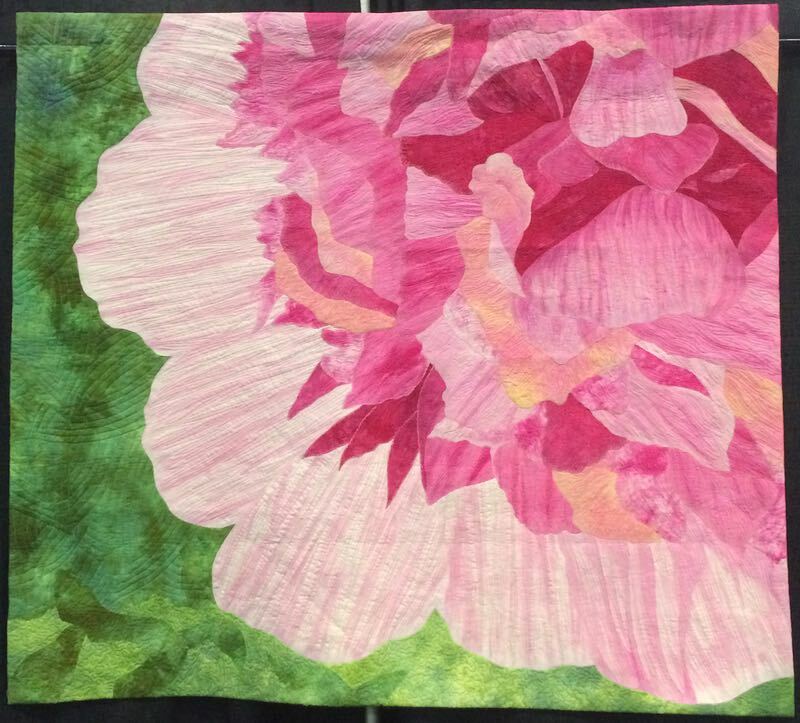 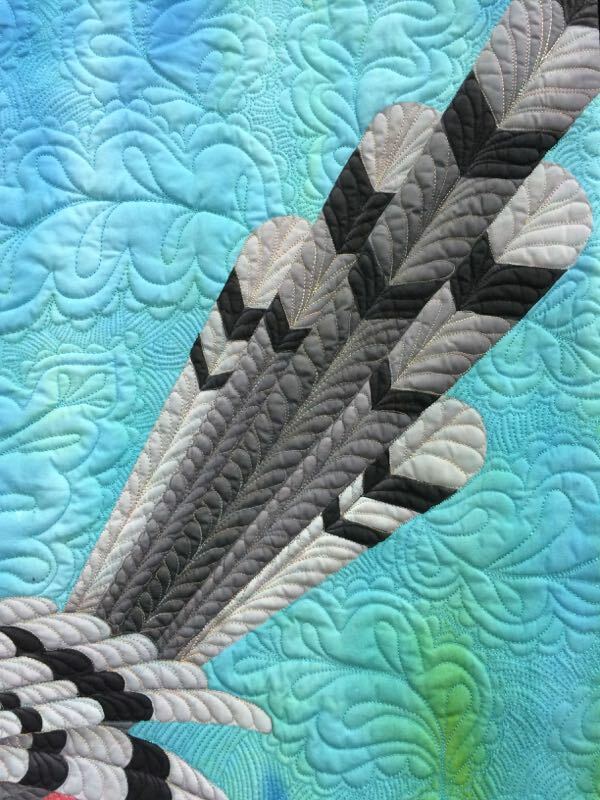 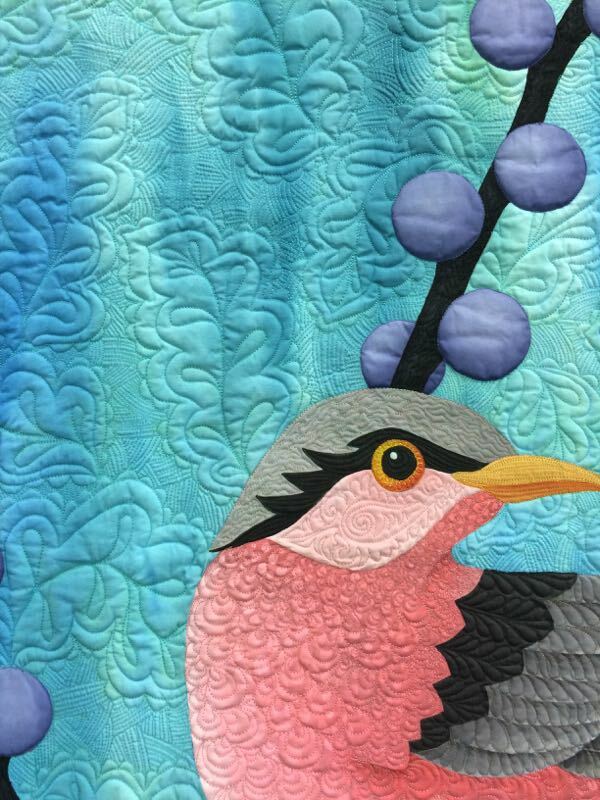 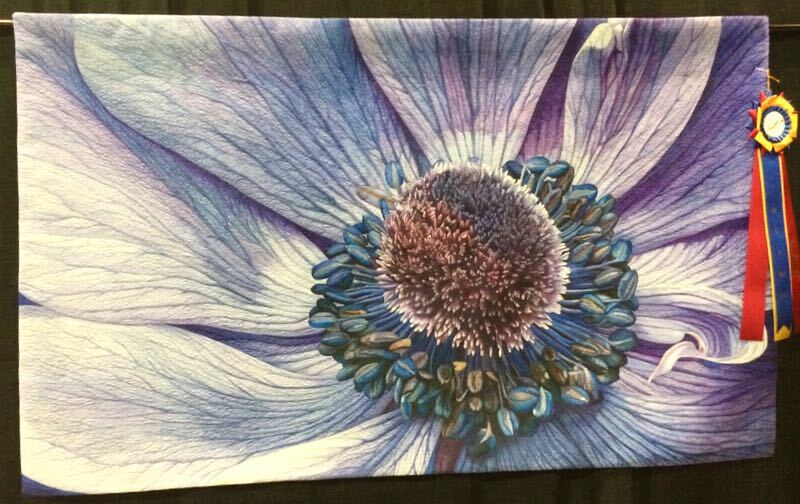 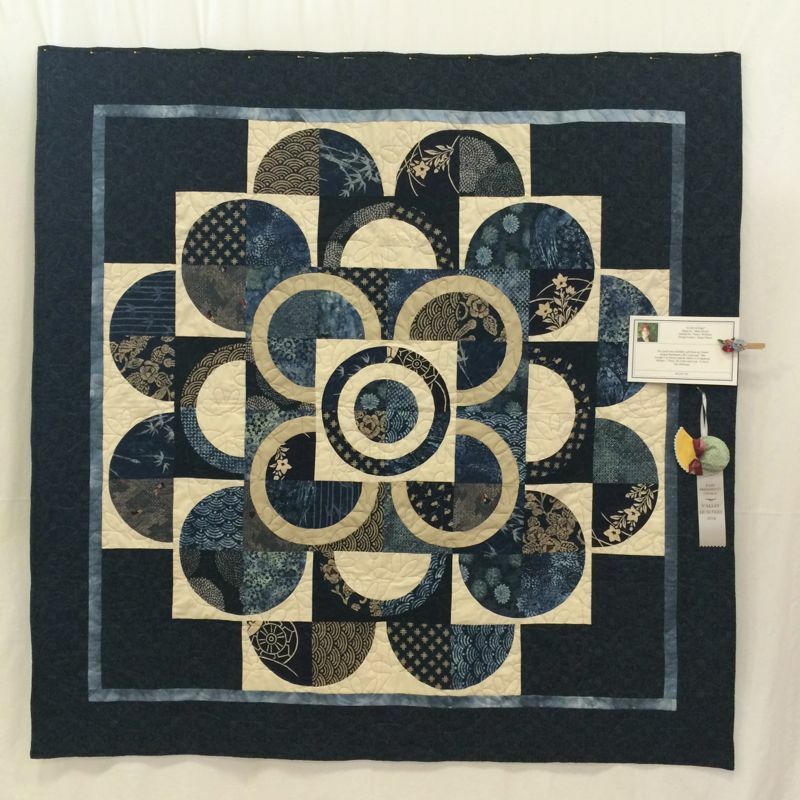 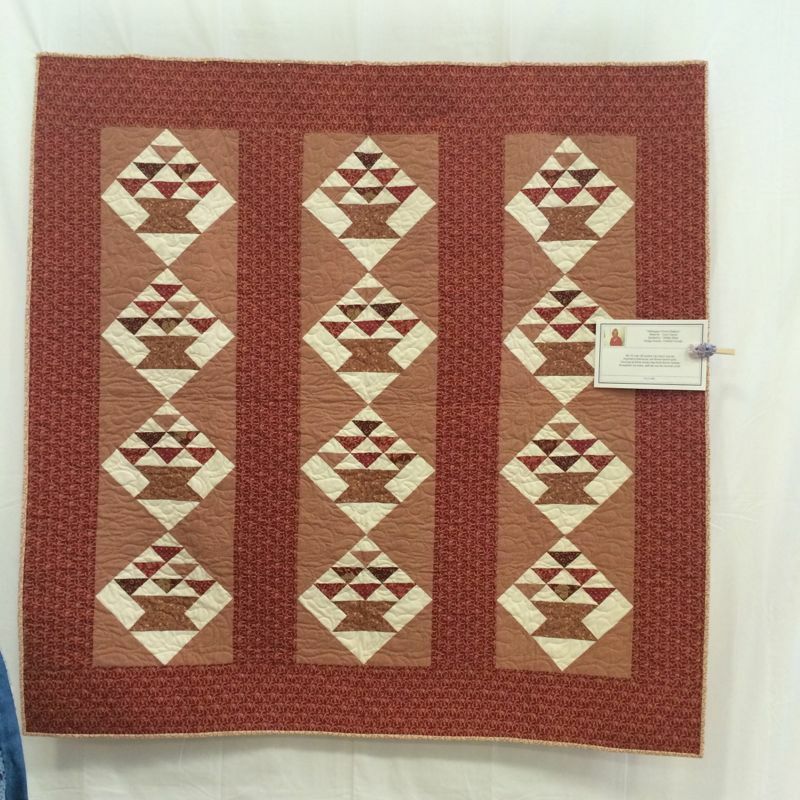 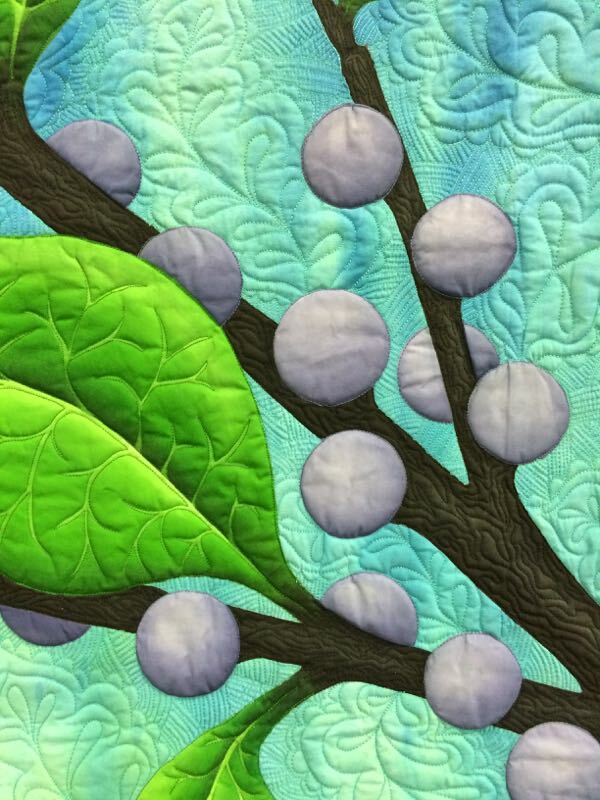 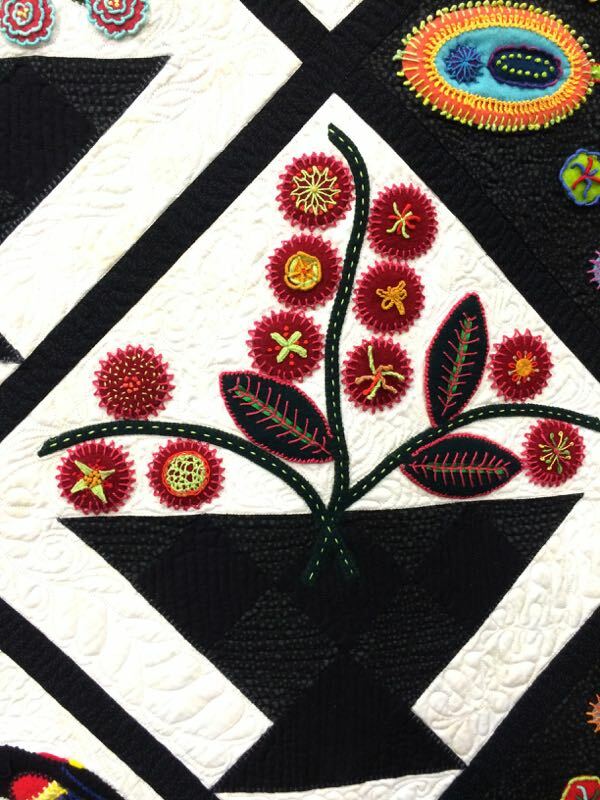 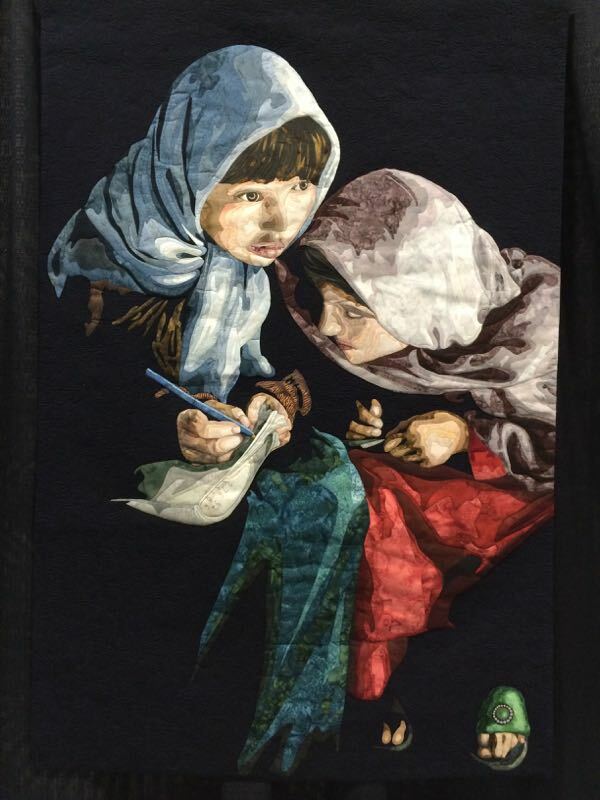 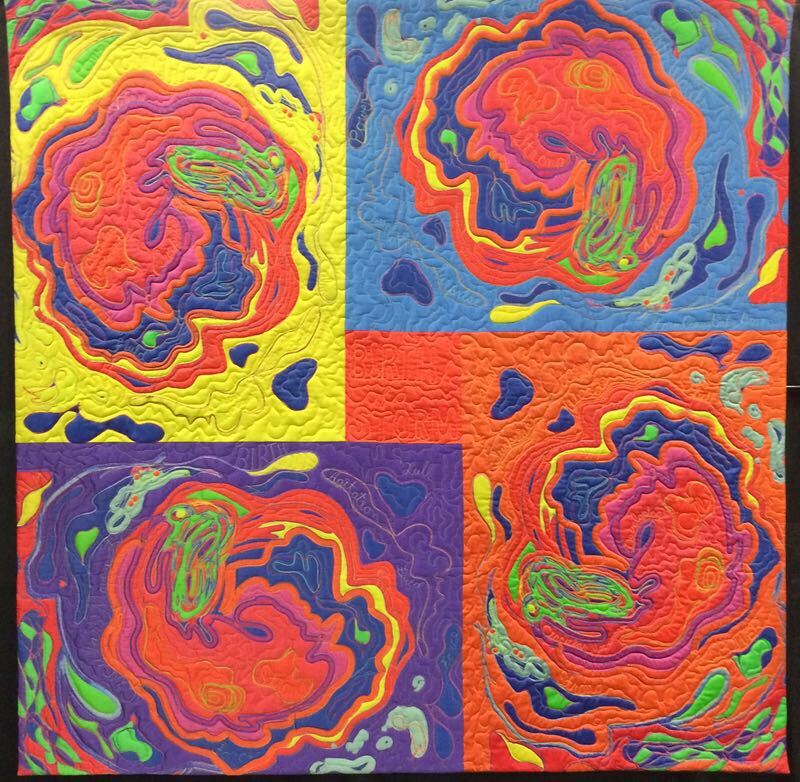 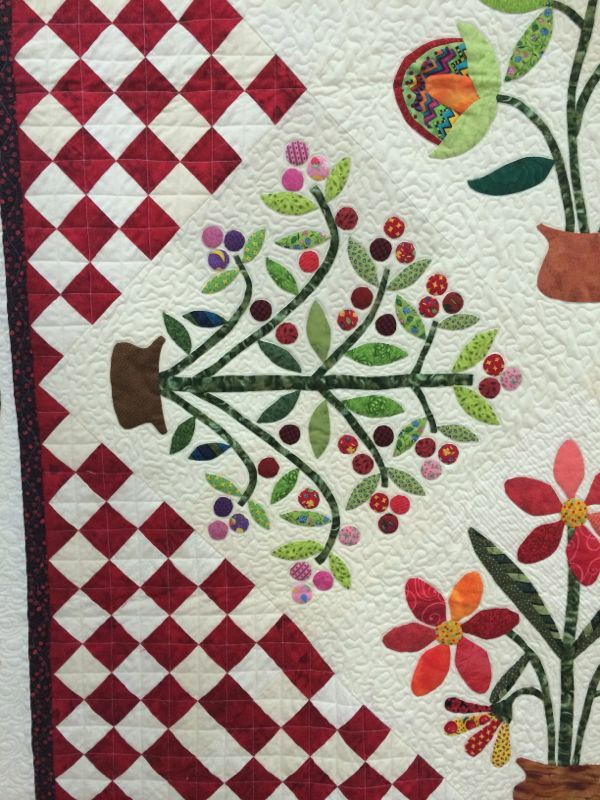 Mary Myers made Flourishes, and it was quilted by Jodie Krot. 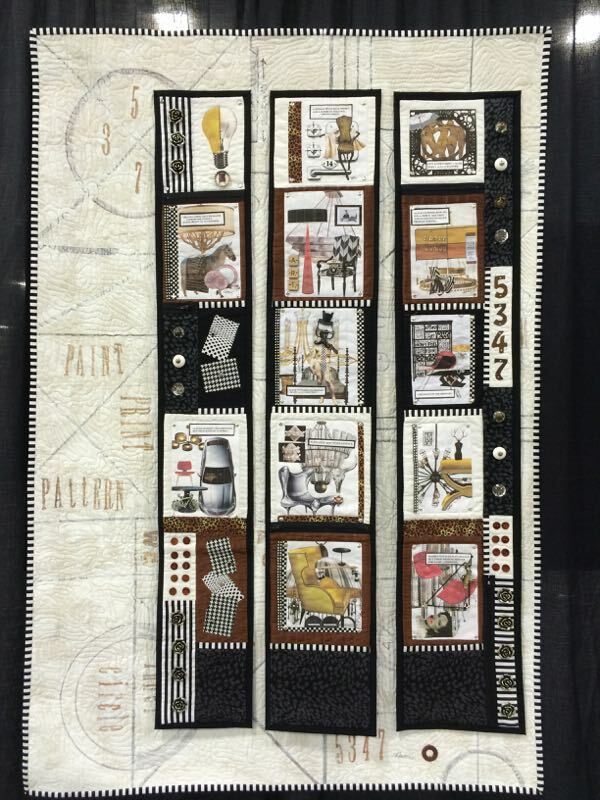 The design source was Piece O’ Cake Designs. 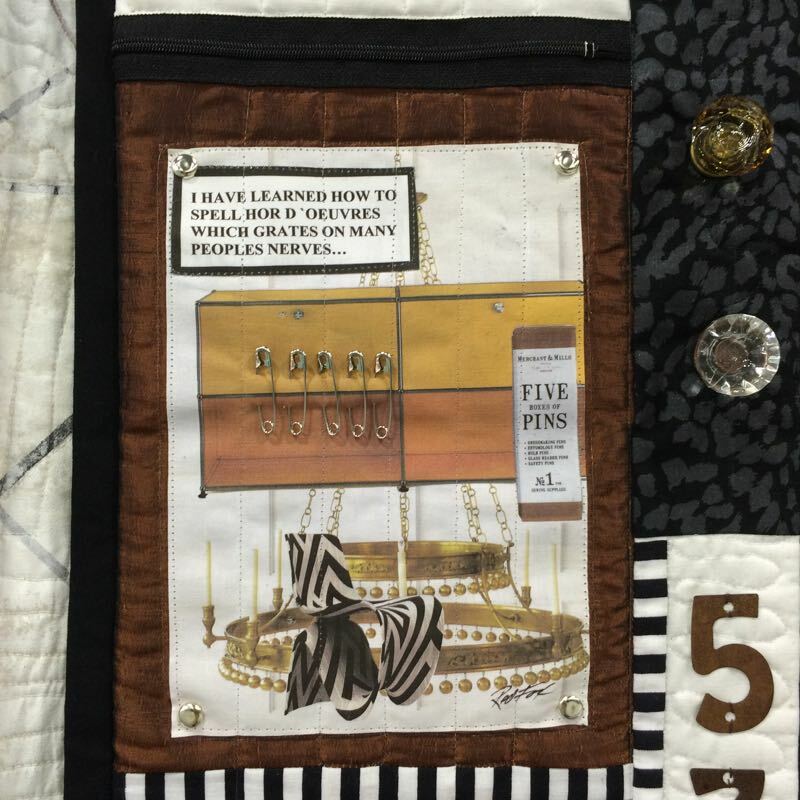 She writes that this was a tribute for Edward Myers’ life: “I took the squares with me everywhere. 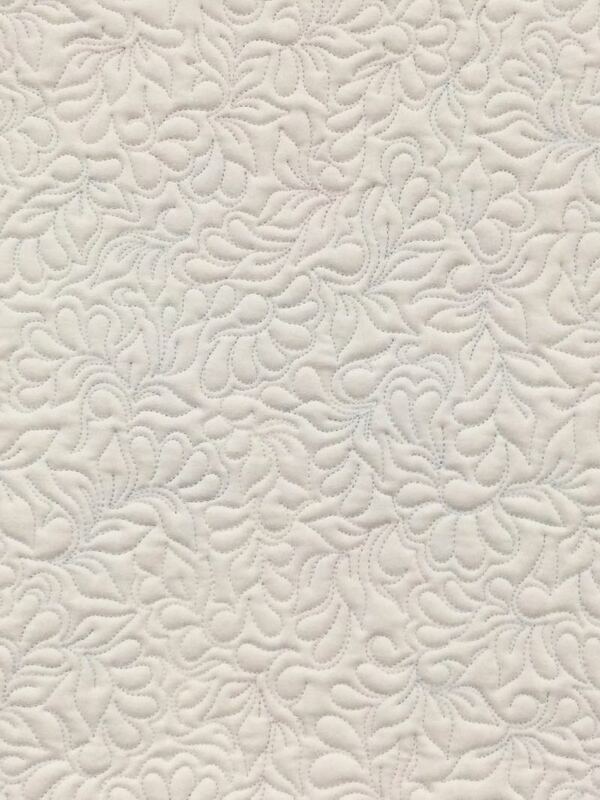 Many doctor & hospital visits. 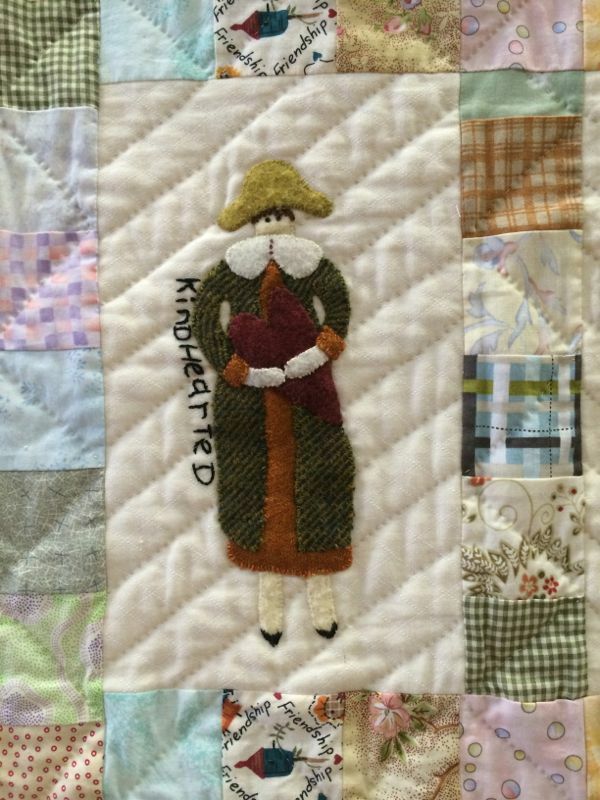 I started it in October, 1999 but it was not completed until April 2007, six-and-a-half years after his death.” I don’t know if Edward was a son, or a husband, but it is a wonderful memory quilt. 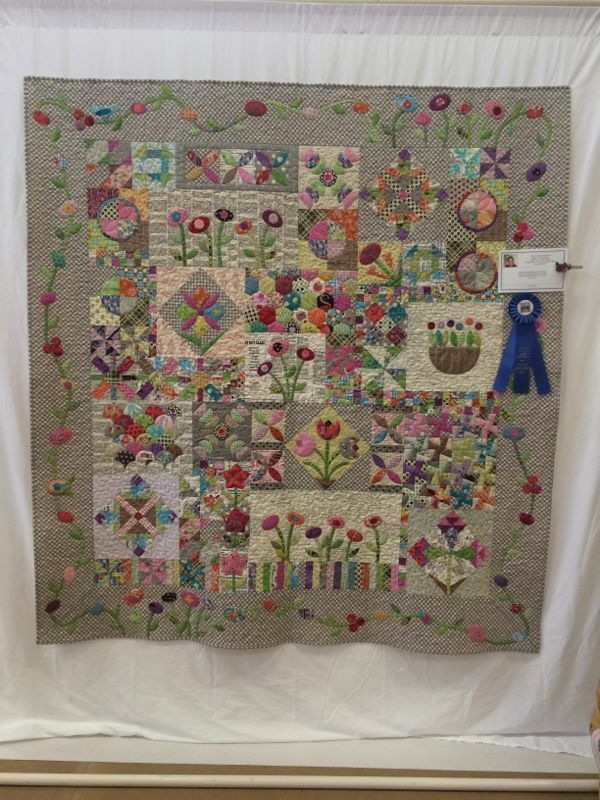 Dancing Wonky Wildflowers was made by Jacquie Buchanan and quilted by Jami Doto, with the design source noted as “Wonky Wildflowers” by Sandra Workman. 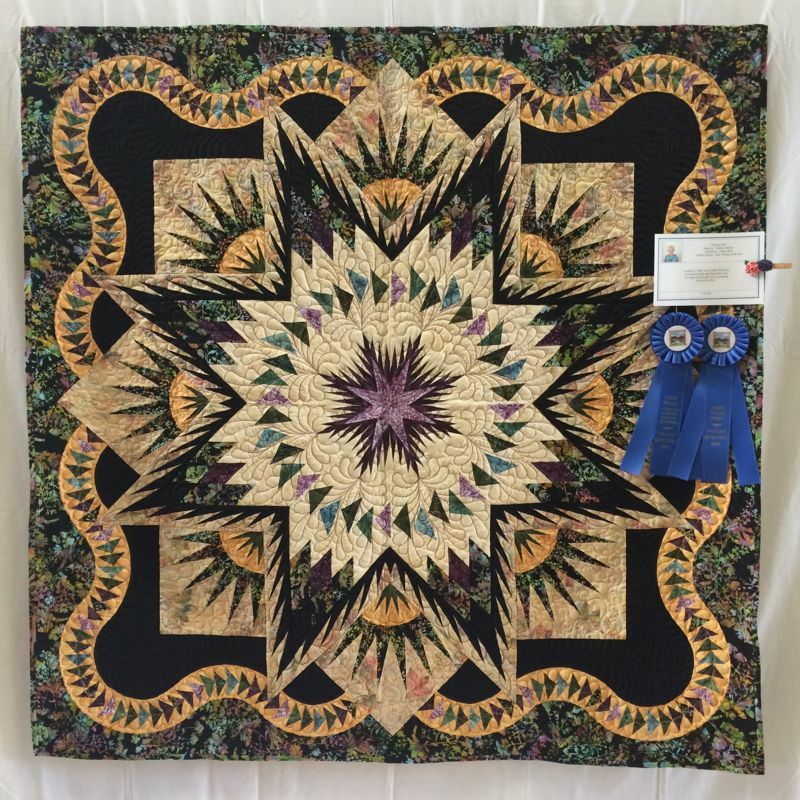 I’m a sucker for a well-done Hunter’s Star quilt (sorry, no name on this one either). 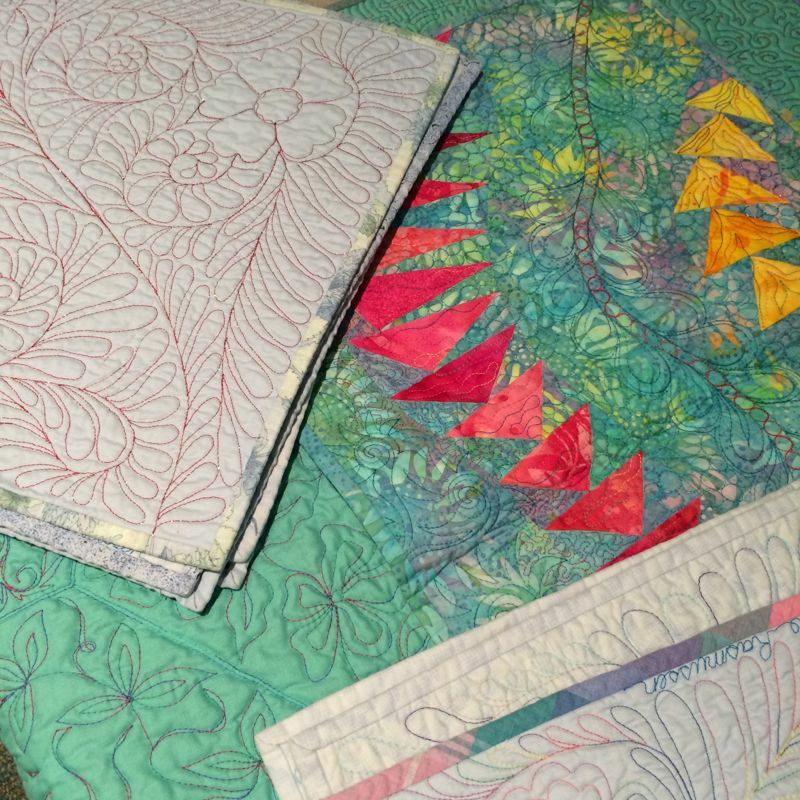 I’ll close with two appliqué quilts. 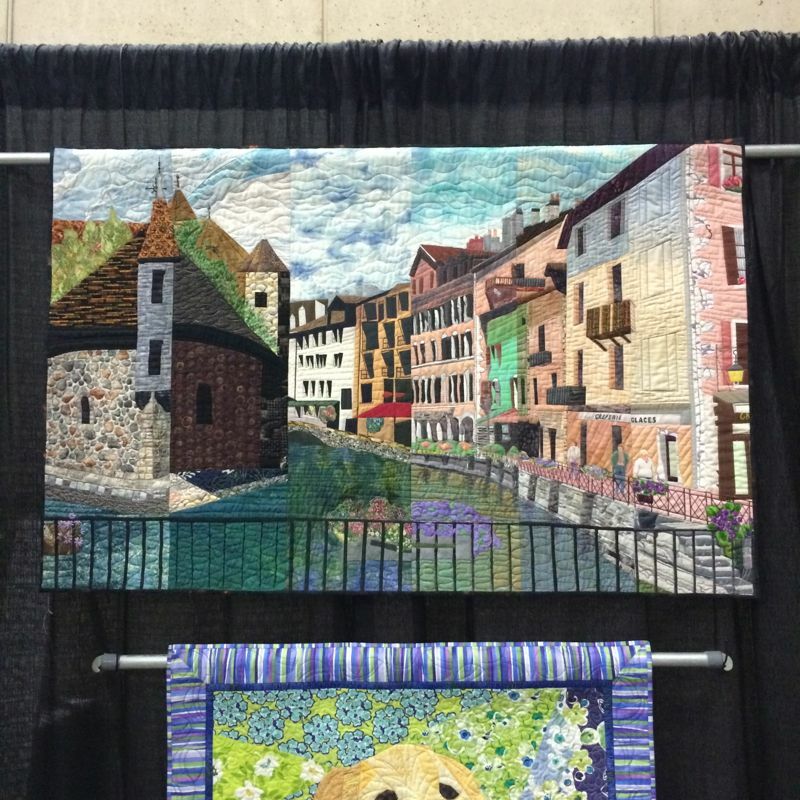 The quilts I’ve shown are only a sample of this show, so come on over next year! 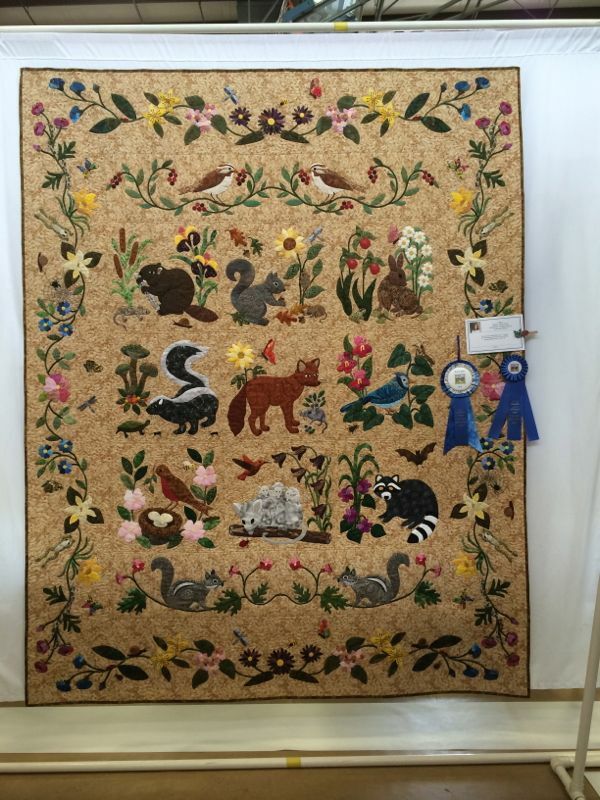 The quilt above, titled Critters, is by Billie Kercmar, quilted by Karen Gehring (from Woodland Creatures by Rosemary Makhan).